Chinese mining factories are interested in training mining engineers and get acquainted with mining experience in difficult environments. Such cooperation becomes possible thanks to the endeavors of the Dnipropetrovsk Chamber of Commerce and Industry, National TU Dnipro Polytechnic and DTEK Company. Prospects for cooperation development were discussed during the working meeting of the President of the Dnipropetrovsk Chamber of Commerce and Industry Vitaliy Zhmurenko with Gennady Pivnjak, the Rector of National TU Dnipro Polytechnic, and Alexander Shashenko, the Vice Rector for International Relations of the University. This step is a new stage in the Ukrainian-Chinese cooperation, which was intensified in April this year, when the Chinese delegation from Pangzhou, headed by the Vice-Mayor, visited Dnipropetrovsk region to participate in the II International Conference "Trends and Prospects for Extraction and Use of Coal in Ukraine and in the World "organized by DTEK in cooperation with National TU Dnipro Polytechnic and the Dnipropetrovsk Chamber of Commerce and Industry. The conference was devoted to the modern problems of the coal industry, thermal and alternative energy, environment protection and prospects of mines that have exhausted their natural resources. 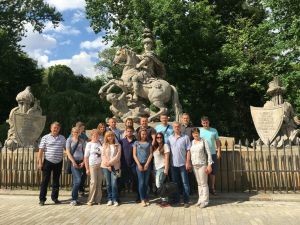 Future visit of the regional delegation, consisting of representatives of the company DTEK, National TU Dnipro Polytechnic, Institute of Geotechnical Mechanics of the National Academy of Sciences of Ukraine named after. M. S. Polyakova, Dnipropetrovsk CCI at the Economic Forum in Pangzhou (November 7-9) was also discussed during the meeting between the President of the DCCI and the governance of the National TU Dnipro Polytechnic. The purpose of the Economic Forum in Pangzhou is acquaintance with the coal industry and the coal mining situation in the region, negotiations of the start of training of Chinese miners on the basis of a regional profile university that trains engineer students from many countries, including from Asian countries. At the end of the meeting, Vitaliy Zhmurenko expressed confidence in continuing the dialogue between the Chamber and the University, which closely co-operate in the foreign economic direction for many years. In particular, participants discussed the necessity to continue joint work in the field of intensification the training base of the Ukrainian-German Cultural Center under the University, which has the opportunity to become possible with the support of the Magdeburg Chamber of Commerce and Industry, which is long-term partner of the Chamber and co-founder of the Ukrainian-German cooperation office in Dnipro. These developments create opportunities for intensifying student exchanges and joint technical projects. And the joint work in establishing the Ukrainian-German and Ukrainian-Chinese dialogue even more will intensify this cooperation. Today Georgia takes 16th place in the world for ease of doing business in the World Bank and IFC DoingBusiness ranking. The state provides favorable conditions for entrepreneurs to stimulate economic increasing. Last years the tax system of Georgia stays in the stage of constant reform. In particular, the main attractive features of Georgia for entrepreneurial activity are absence of currency restrictions and state control and also convenient tax regimes. So, since the beginning of 2017 in the Tax Code of Georgia changes in the system of income taxes have come into force according to the Estonian model. These changes include zero tax rate on undivided (reinvested) profit of resident companies. At the same time, the interest rate tax on the profit, which is 15%, has not changed. Such step had a positive effect in terms of reducing the current account deficit of checking account, increased access of companies to financial resources, gave a chance to increase the amount of capital, simplified tax accounting and administration and promoted for getting more opportunities for business development. Three new tax initiatives of the Government of the country became the next step, which has to ease tax burden on business and increase SME shares in Georgia′s economy. The first initiative has a purpose of significant reduction of bureaucratic pressure on entrepreneurs and will be in decreasing in 5 times the number of accounting documents. The second initiative provides for simplifying procedure and increasing tax amount in case of sale of products by local entrepreneurs or farmers in rural areas. The purpose of the third initiative is to transform Georgia into a regional financial center. The initiative will allow non-residents to register companies online on the territory of Georgia. The tax collection and control of the tax environment are carried out by the Tax Department of Georgia, which is subordinate to the Ministry of Finance of Georgia. Tax administration and customs clearance procedures can be done online. Also, by June 2018, Georgia signed Double Taxation Avoidance Agreements with 55 countries, including Ukraine. Now there are currently no restrictions on currency conversion and repatriation of capital and profits in the country. property tax ( up to 1%). According to the Georgian Economic Liberty Act, which was adopted by Parliament of Georgia in 2011 in the framework of reforms, Government is not allowed to raise tax rates (excluding excise) or increase the amount of taxes without holding a national referendum. New business strategies, useful advices and acquaintances are indispensable components of the Dnipro Business Support Center, which once again initiated training for representatives of small and medium-sized businesses, in order to discover the secrets of competitive advantage. 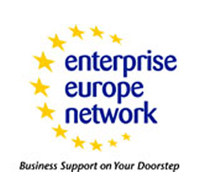 Founded under the Dnipropetrovsk Chamber of Commerce and Industry with support of the EBRD, the Business Support Center combined the best traditions of business in the region and the experience of leading European experts within the framework of the EU4Business initiative of the European Union. «Today, thanks to this initiative, we have the opportunity to invite the best Ukrainian and foreign speakers,» said the first vice-president of The Dnipropetrovsk Chamber of Commerce and Industry Nina Aleknovych, welcoming the training participants. Today, thanks to the training «Technology of Creation of the Determinative Competitive Advantage (DCA)», more than 30 entrepreneurs in the region have gotten the opportunity not only to master the basic principles of the technology of the DCA, but also to get acquainted with the ready-made cases of the DCA of different types of business and to trace their creation using the Theory of Restrictions. «In Europe, the main gross product is created up to 80% of small and medium-sized businesses. We are doing it in large enterprises. 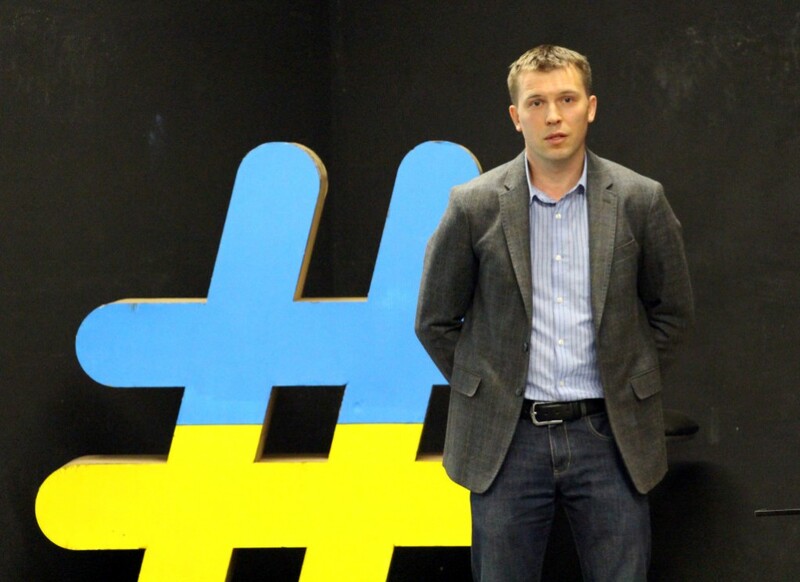 We want to teach our SMEs to advance their business through marketing, to make a high-quality product, by creating new positions, increasing sales and opening new markets for themselves, not only in Ukraine, but also abroad,» said the vice-president of the Dnipropetrovsk Chamber of Commerce and Industry Sergiy Kucheryavenko. «The main idea of creating a competitive e advantage lies in the fact that all marketing of the company should be directed at increasing the value in the eyes of the consumer. Today, in detail, step by step, we will reveal the secrets of competitive advantage, so that you can master these modern technologies and apply them in your own business,» said the speaker of the training, general director of consulting company Apple Consulting Julia Pliyeva. The spoker introduced training participants to the methodology of Theory of Restrictions - a specific approach to business management. Its main point is that the principles of exact sciences can be applied in any field. In particular, thanks to Theory, you can find a solution for retail, marketing, distribution and any other kind of activity. The information was new for participants, caused a lot of questions to which they received answers. «It was very interesting to learn new information and to get acquainted with other participants. Competition today is one of the main, most important components of business. If you are not competitive - your business will not be successful. I have heard a lot and now will try to apply this knowledge in practice», - said the participant of the training, entrepreneur Katherine. The Business Support Center organizes similar educational and practical events regularly. In particular, two-day franchise business development training and an annual Export Conference are planned there in the near future. So do not miss unique opportunities and follow our announcements. The Dnipropetrovsk Chamber of Commerce and Industry initiated a seminar for entrepreneurs of the region who are interested in establishing the effective international trade. The workshop presented new opportunities and tools for an effective foreign economic activity of the enterprise. The participants had the opportunity to receive a number of recommendations from the leading expert in the international trade, the Vice-President of the Ukrainian Chamber of Commerce and Industry Sergii Svystil. «If we don’t understand where and how the world moves, how can we develop ourselves? We must respond to the processes of globalization and know how to use these changes to our advantage. Ukraine is not an advanced country, so we are able to adapt and absorb all these innovations in order to develop our own economy. The Dnipro is the leader in terms of exports and in terms of output. Accordingly, it is important for entrepreneurs in the region to know how to use these innovations skillfully in their favor», – the lecturer said. As part of the free discussion, the participants discussed the practical aspects of organizing international trade, including conducting effective negotiations and checking potential counterparts, joining other countries' markets in a shortage of funds, new approaches in customs and tax policy, and reducing risks and solving problematic issues, related to the supply of low-quality goods and currency control. The meeting of German and Dnipro agrarians took place thanks to the fruitful and long-term cooperation of the Dnipropetrovsk and Magdeburg Chambers of Commerce and Industry within the framework of the Ukrainian-German cooperation bureau in the Dnipro. From 01 to 06 July, the region was visited by Christophe Lehman, owner of the German firm “INOGET”, which specializes in the production of samplers for grain. The main purpose of the visit was acquaintance with the agricultural elevators of the region and the search for buyers for the products. Within the framework of the visit, Mr. Lehman visited four elevators and the agricultural enterprise of the chairman of the Association of Farmers and Private Landowners of the Dnipropetrovsk region Anatoliy Gayvoronsky. Two elevators showed interest in the establishing further cooperation with Mr. Lehman in the matters of purchasing his company's products and consulting on the necessary equipment of German production. At the end of his business trip, Christophe Lehman noted that he plans to visit the region in August this year. Once again, within the EU4Business initiative, regional entrepreneurs were able to gain new knowledge from the best Ukrainian and international experts. President of the Ukrainian-Austrian Association Alfred Praus visited the DCCI to talk about the organization of trade and economic cooperation. Alfred Praus presented the activities of the Association; spoke about the experience of attracting foreign partners, and about the willingness to conduct training for Dnipro entrepreneurs. The intercultural cross-management, the introduction of business projects with European partners, the search for and identification of potential investors can become the main training issues. He expressed readiness to announce the annual Dnipro Economic Forum, which will be held in November 2018, among members of the Association and potential investors, as well as the unification of the leaders of bilateral associations. President of the Dnipropetrovsk CCI Vitaliy Zhmurenko noted that positive foreign experience is always useful for revealing the business potential of the region. Ambassador Extraordinary and Plenipotentiary of the Republic of Uzbekistan in Ukraine Mr. Alisher Abdualiev visited the Chamber to discuss prospects and possible areas of cooperation between the region and the Republic. According to the results of 2017, the trade turnover between Uzbekistan and Ukraine increased by 36%. And for the first quarter of this year, the trade turnover increased by 60%. The Uzbek Ambassador stressed that the trade turnover indicators are growing at a dynamic pace, and the scale of production cooperation between our countries is gradually expanding. 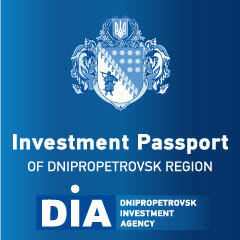 In turn, Vitaliy Zhmurenko noted that the Dnipropetrovsk region has the largest share of foreign investment. Of particular interest are opportunities for cooperation in such spheres of the economy as the export of agricultural products and their processing, the production of machinery and equipment for the extractive and agricultural industries. In continuation of the dialogue, the President of the DCCI sent proposals and a project on cooperation with the Chamber of Commerce and Industry in Fergana region for consideration. In the near future, with the support of the Embassy of Uzbekistan in Ukraine, consultations will be held between the Chambers on specific areas of cooperation. A working meeting between Wolfgang Mössinger, Consul General of the Federal Republic of Germany in Donetsk (with the office in Dnipro) and Vitaliy Zhmurenko, the president of the DCCI about the terms of further cooperation was held. The main issue of the meeting was the problem of economic development and further cooperation with the aim of developing the region's enterprises and cooperating with the German side. Vitaliy Zhmurenko suggested considering the possibility of holding a week of the German economy in Dnipro. In his opinion, this will help to intensify cooperation between the Dnipropetrovsk and German businesses. They also discussed the possibility of the Chamber's cooperation with technical assistance projects, which are financed by the German government in the framework of a partnership with the German Society for International Cooperation (GIZ). During the meeting, Wolfgang Mössinger promised to support the Chamber with regard to inviting representatives of German business to the Dnipro Economic Forum. 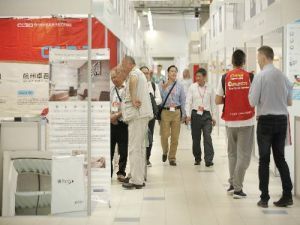 The entrepreneurs of Dnipropetrovsk region, headed by the DCCI, participate in the work of the annual trade and economic platform – the exhibition of the China Homelife Show 2018 for the seventh year in a row! 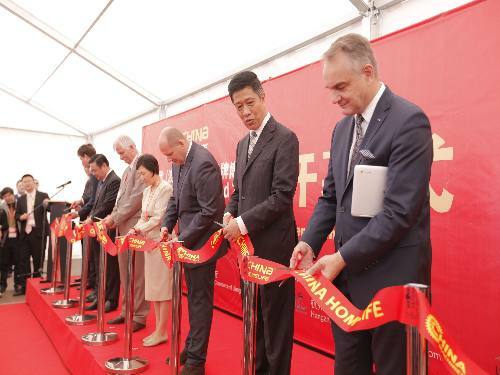 China Homelife Show is an effective business platform for leading Chinese companies that want to cooperate with companies from Central and Eastern Europe. This year, the exhibition brought together more than 1600 Chinese manufacturers and more than 2000 interested European companies. Within the framework of the exhibition, more than 20 entrepreneurs of the region not only had the opportunity to hold business meetings with potential partners from China but also enjoy the Warsaw urban landscape. This year the exhibition was focused on such segments of the economy as new energy, food processing equipment, plastic processing machinery, construction equipment and power tools. A pleasant innovation was the familiarity with the integrated trading platform of China Sourcing Center, thanks to which contact with Chinese manufacturers will be carried out 24 hours a day, access to Chinese products will become simpler, and entrepreneurs of the region will be able to send commercial inquiries directly to Chinese manufacturers. The exhibition of the China Homelife Show is held annually, therefore, the entrepreneurs of the region will have an opportunity to join this indisputably large-scale event! 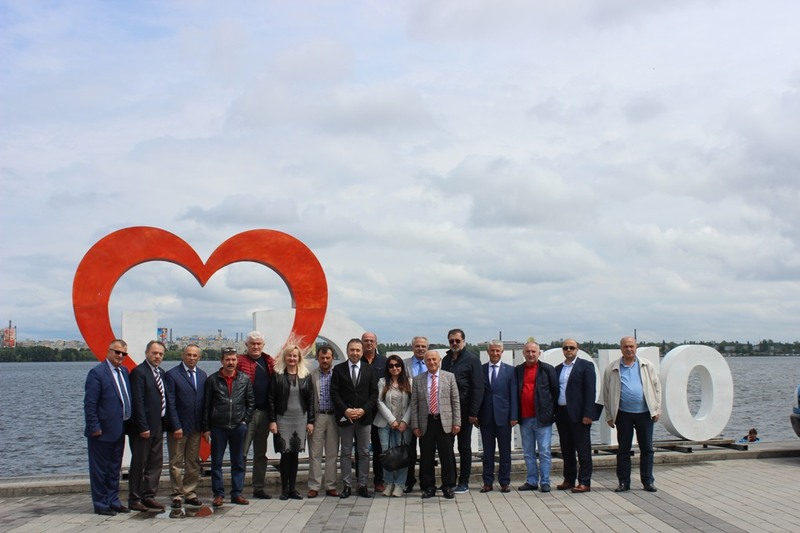 The delegation of the Extraordinary and Plenipotentiary Ambassadors of the Visegrad Group visited the Dnipropetrovsk CCI to get acquainted with the socio-economic situation in the region. 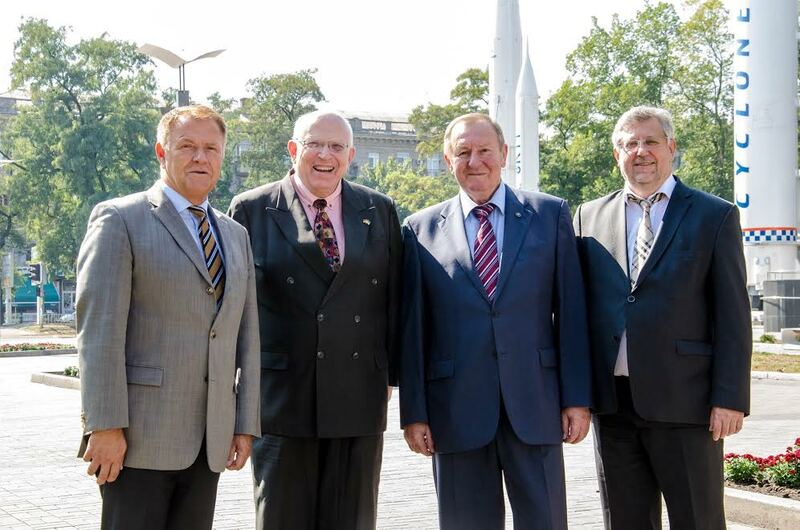 Among them are Erno Keskeny, Ambassador of Hungary, Siváček Juraj, Ambassador of the Slovak Republic, Radek Matula, Ambassador of the Czech Republic and Jan Pieklo, Ambassador of the Republic of Poland. The President of the DCCI Vitaliy Zhmurenko thanked the ambassadors for their support of Ukraine and cited examples of cooperation of the region with the countries of the Visegrad Group. The meeting participants discussed the possibilities of attracting the International Visegrad Fund's resource to support international economic cooperation projects, joint problems in the labor markets of our countries, the possibilities of student exchange programs, the prospects for recognizing Ukrainian diplomas in a number of specialties. In turn, the V4 ambassadors underlined the great importance of continuing deep reforms in Ukraine and the interest in direct cooperation between the regions of the Visegrad Group countries and the regions of Ukraine. Businesswomen of the Dnipropetrovsk region took part in the world business cafe «Women's Entrepreneurship: Access to Foreign Markets» within the SheExports platform. This was achieved thanks to the joint organization of The Canada-Ukraine Trade and Investment Support (CUTIS) Project, the Export Promotion Office (EPO) to the Ministry of Economic Development and Trade and the Dnipropetrovsk Chamber of Commerce and Industry. The key goal of the event was the exchange of experience between businesswomen, who seek to develop exports of goods and services. In general, discussions within the world business cafe revealed all aspects of the process of exporting goods and services to Canada, in particular, partner search, negotiation, logistics, customs clearance, major obstacles, etc. Dnipro HR Forum attracted the best experts of Ukraine in the field of HR to share with colleagues an invaluable experience in one of the most significant factors in the development of companies – a human capital. The event was organized by the Business Support Center based at the DCCI together with the EBRD as part of the EU4Business initiative. The forum was devoted to HR-strategies, development, motivation and solving possible problems in search, selection and work with personnel. The secrets of successful cases were presented by experts from Noosphere Engineering School, Allo, HeadHunter, DTEK, S.I.Group, the Incubator project, Comfy, the Confetti restaurant chain, PrivatBank, as well as representatives of the authorities and universities in the region. 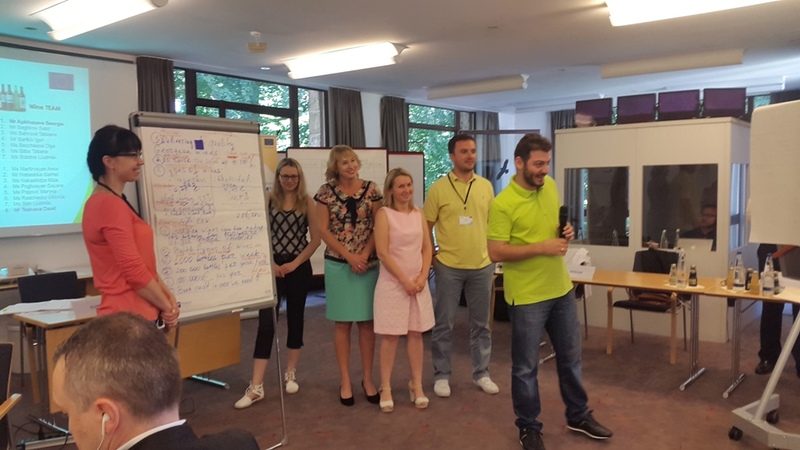 In addition, the participants had a unique opportunity to take part in a practical masterclass of an international HR-expert at the Management, a practice with many years of personnel management experience – Ute Buhler. With the support of the Dnipropetrovsk CCI, the authorities and businesses of the region, the CCI of Ukraine hosted a unique international business event «Dnipropetrovsk region: an open investment dialogue». The DCCI attracted the best representatives of regional business. In addition, the president and the first vice-president of the DCCI, Vitaliy Zhmurenko and Nina Alekhnovych, held a number of meetings with the guests of the event. Such event is a dialogue between the state, business, investors and leading experts, whose goal is to create a space for investment and development of the region. Representatives of the diplomatic corps and foreign partners from fifty countries joined the open dialogue of power and business, which personally could see priority directions of investment and perspective spheres of cooperation, as well as obtain the necessary information and contacts directly on the spot. The Business Support Center based at the DCCI together with the EBRD as part of the EU4Business initiative brought together the entrepreneurs of the region in a four-day training «Keys to Financial Management», who interested in developing entrepreneurial skills. The training was conducted by two experienced trainers from Belarus – Yehor Yehorushkin and Kirill Linnik, who specialize in training financial management for company owners and «non-financial» managers. The training opened questions for the Dnipropetrovsk audience in the field of finance: how to understand financial reporting with your business; what to do to make profit grow; how to identify risks and whether something can be done with them; how to build a financial management system and choose the source of funding. And also, what skills are necessary for negotiations with banks and venture companies. The president of the Dnipropetrovsk CCI Vitaliy Zhmurenko took part in the European Congress of Self-Government in Krakow. Organizer of the Congress was the Institute of Eastern European Studies. 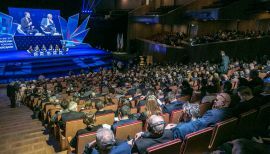 The purpose of the event is to build a favorable atmosphere and conditions for cooperation between the countries of Central Europe and the regions. Also, the president of the DCCI met with the long-standing partner of the Chamber – the president of the Krakow CCI Sebastian Hvedechko. The Presidents expressed their desire to continue cooperation in the development of economic ties between the regions and become platforms for interaction between the business of both countries. Within the framework of the Dnipropetrovsk CCI «Green Chamber. The Sustainable Development Initiative» project, which is implemented by the German Society for International Cooperation (GIZ) within the Program to support the «green» modernization of the Ukrainian economy, in cooperation with the Department of ecology and natural resources of the Dnipropetrovsk regional state administration, a number of ecological seminars on the theme «Environmental legislation of Ukraine. Innovations 2018. Actual issues of waste management» was organized for entrepreneurs of the region. The seminars were aimed to increase level of environmental awareness. 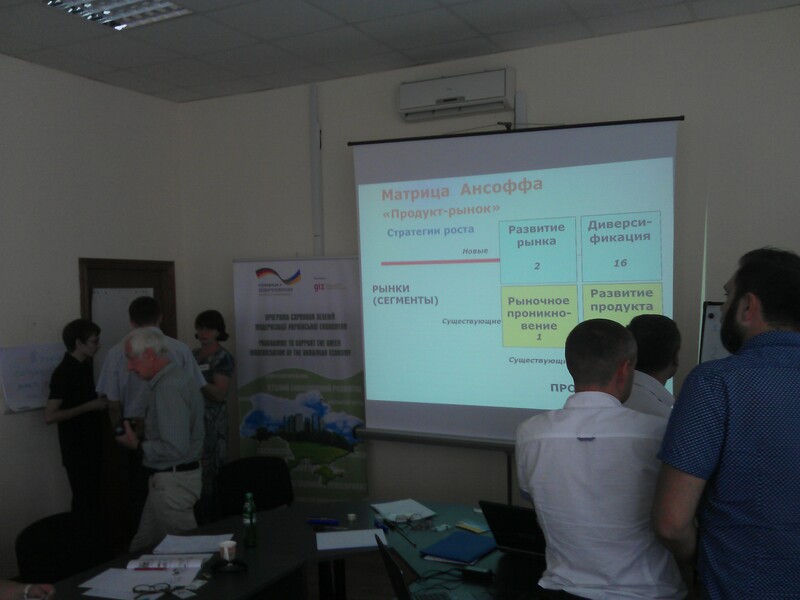 During the sessions, the participants got acquainted with current issues of the environmental legislation of Ukraine, the principles of waste management, innovations in the field of rational use of land resources and water bodies, as well as with the regulatory regulation of the protection of atmospheric air. 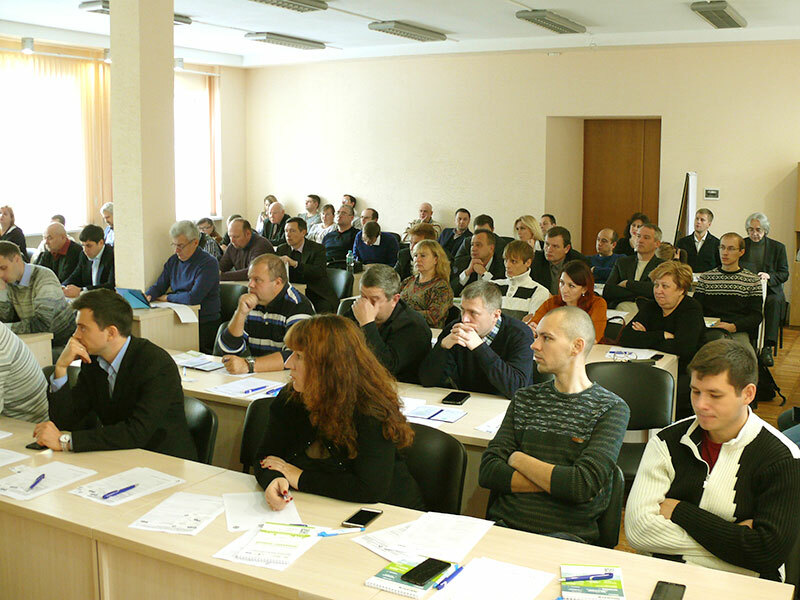 In order to attract more environmental specialists to training, seminars were arranged in three cities of the region: Nikopol, Kamianske and Dnipro. Representatives of the Albanian business visited the Dnipro to meet with leader of the Dnipropetrovsk Chamber of Commerce and Industry and regional entrepreneurs as well. The organizer of the Albanian business mission was the Donetsk Chamber of Commerce and Industry. Albanian businessman Arben Zdrava, head of the Albanian agro-industrial company «Zdrava», presented its potential for export of fruits and vegetables to Ukraine. Also, Albanians are interested in supplies of oil, sugar, flour and other food products from Ukraine. Both sides of the meeting agreed to consider the possibility of arranging mutual business visits of entrepreneurs of countries in the near future with the aim to develop further cooperation. The Dnipropetrovsk Chamber of Commerce and Industry initiated a conference and exhibition «Economy. Ecology. Efficiency. Cooperation for the sake of sustainable development of the region»following the results of «Green Chamber. The Initiative of sustainable development» project. The ceremony of awarding winners and laureates of the competition for innovative products, best technical and service solutions in the «green» economy «Green Impulse. Green Chamber Awards» was held during the conference. The DCCI jointly with the regional authorities and with the support of German partners organizes this competition the second year in a row. The goal of the competition is to promote the introduction of efficient technologies, solutions and services in the «green» economy that reduce a resource consumption and negative impact on the environment while maintaining their economic efficiency. The presentation of exhibition of «green» providers, producers and suppliers of technological solutions, services and products was arranged within the framework of the conference. In particular, houses were made from straw panels, an eco-foundation on «turnkey» for 48 hours, a solution for roof waterproofing and others. The vice-president of the DCCI Sergiy Kucheryavenko presented the opportunities and results of «Green Chamber. The Sustainable Development Initiative» project, which is implemented by the German Society for International Cooperation (GIZ) within the Program to support the «green» modernization of the Ukrainian economy. Within the framework of the Dnipropetrovsk CCI project training for more than three thousand managers was arranged, energy specialists, engineers and environmentalists of enterprises, civil servants, local consultants, scientists and entrepreneurs of the Dnipropetrovsk region. An active tool for business, which is one of the results of this project, can be the regional competence base/providers of «green» services on the portal www.greenchamber.org.ua. Its goal is to develop the market of «green» services in the Dnipropetrovsk region, a system support for a platform for contacts, an information exchange between providers of «green» services/products and end users. Registration on this resource is free of charge! The International Trade Club delegates, which unites more than 60 diplomatic and trade representatives of foreign Embassies accredited in Ukraine, arrived in the Dnipropetrovsk Chamber of Commerce and Industry to get acquainted with the investment potential of the region. President of the Trade Club Liu Jun noted the importance of this meeting: «The main goal of the Club is to inform foreign diplomats about the economic and export potential of Ukraine and individual regions. And today's meeting is the beginning of closer and productive cooperation with those countries whose representatives are present here». The Dnipro entrepreneurs got an opportunity to present their investment projects with a wide range of production in various spheres of the economy after an official meeting. The result of the meeting was the solemn signing of the Agreement on further partnership and cooperation between the Dnipropetrovsk Chamber of Commerce and Industryand the International Trade Club. 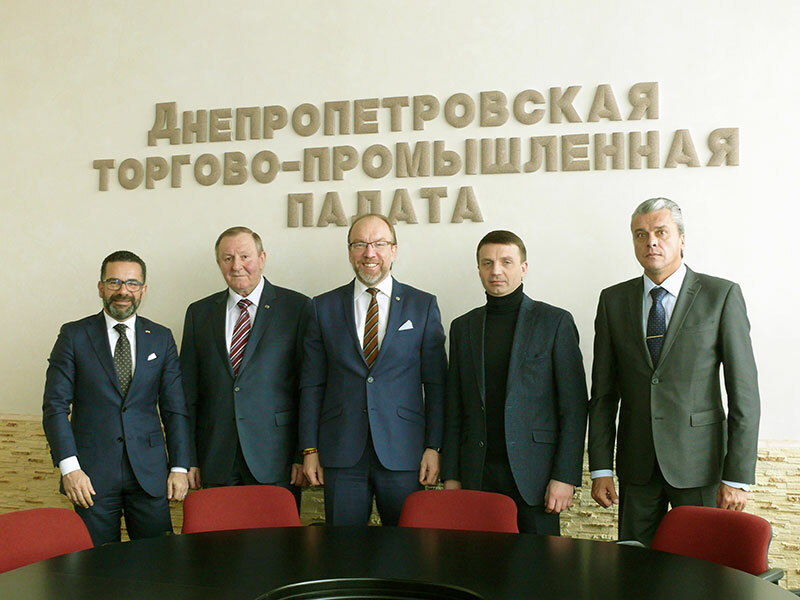 On December 4th, the President of the Dnipropetrovsk Chamber of Commerce and Industry had a meeting with representatives of the Honorary Consulate of the Federal Republic of Brazil in Dnipro. A powerful impetus for establishing strong business relations between the Dnipropetrovsk Chamber of Commerce and Industry and representatives of the Brazilian Embassy was opening of the Honorary Consulate of the Federal Republic of Brazil in Dnipro on August 2, 2017. The visit’s goal was to discuss perspective areas of the cooperation in development of economic, scientific and technical partnership between counties, possible creation of a platform for united activities between businesses. During meeting, the President of the Dnipropetrovsk CCI Vitaliy Zhmurenko informed guests about the Dnipro CCI main activities. He focused on the Chamber’s development in the context of providing a wide range of services to promote the products of regional enterprises on the international markets. Accordingly, the establishment of business relations with Brazil can be a useful experience, both for the Chamber and for the development of regional business as well. In order to develop cooperation, the Consulate representatives proposed to consider the possibility of arrangement mutual business visits already in the first half of the year 2018. In addition, the parties discussed possible involvement of the Chamber to further cooperation between the National Mining University and Brazilian high schools, the prospects for student exchanges andgeneral technical projects. 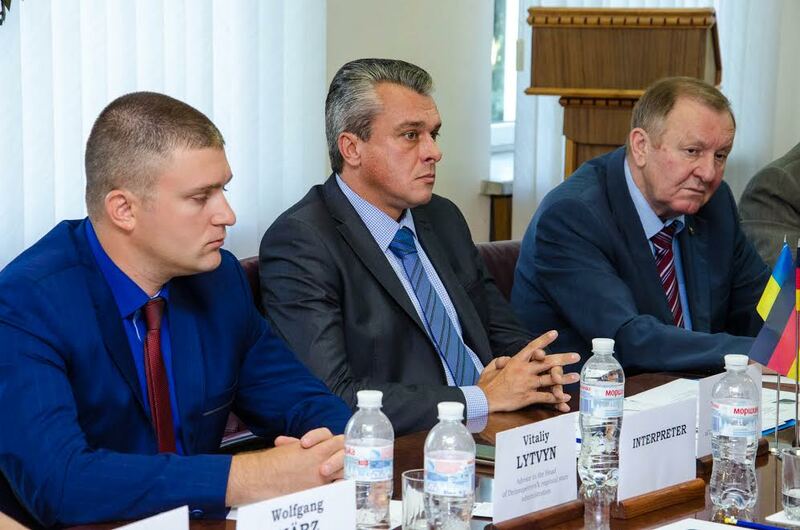 Vice-president of the Dnipropetrovsk CCI SergiyKucheryavenko took part in the Roundtable «New business opportunities in the process of activation of startup movement of the region on the basis of the Dnipro Sikorsky Challenge Startup School». The event was held in the premises of the National Mining University on December 4th, 2017. In September this year, the Sikorsky Challenge Startup School launched the Days of Innovation in Ukraine. The School positions itself as an educational environment for those who want to create and actively develop their business. The «roundtables» were implemented for the regional business elites and training for those who have an innovative idea or seeking new knowledge and experience. On December 4, the Startup school delegates visited Dnipro, where the representatives of the regional government, business, universities and, of course, the Dnipropetrovsk CCI were invited. The key event goal was to determine the main requests from the authorities and businesses of the Dnipropetrovsk region about the results of the activities of the Dnipro Sikorsky Challenge Startup School as an object of regional innovation infrastructure based on the current state development and innovation in various sectors of the economy, considering the challenges of our time. Within the meeting were presented the specifics of work of the «Sikorsky Challenge» system and exchanged experience in development of innovative activities in various spheres of the economy and in different countries. The event participants agreed that such a Startup school is an excellent place for cooperation between business, educationand science. This autumn has brought significant results. The Dnipropetrovsk Chamber of Commerce and Industry involved the 1000th member to its community! 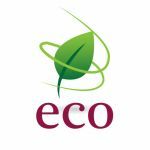 This enterprise is «EDS-Engineering LLC», which is a professional provider of friendly solutions and services to the environment. This event is important not only for the DCCI, but also for the further intensive development of the whole region. The Dnipropetrovsk Chamber of Commerce and Industry is the leading center of business activity in the region, scientific, technical, industrial and agricultural potential of which is known both in Ukraine and abroad. For 22 years of its existence, the Regional CCI has become an effective and competent business partner for many enterprises, business structures, and government agencies. Today it unites a thousand business entities on the basis of voluntary membership. It is clear that the Dnipropetrovsk CCI will be able to develop more intensively if will consist of large number of members. Further expansion of the business community of Dnipropetrovsk Chamber of Commerce and Industry is one of the main tasks and an urgent need for entrepreneurs. Aimed to support this task, the Chamber warmly included 1000th member to his friendly club – «EDS-Engineering LLC» company, which corresponds to the best international standards and practices being leaded by Oleksandr Zapyshnyi. The main mission of the company is development of infrastructure for the efficient, safe and friendly to the environmentusage of electrical energy. For a short period of time, the group of companies «EDS-Engineering» has implemented 1,290 projects in the field of electricity and energy, including projects on alternative energy. For example, the launch of a solar power plant in Pidhorodne (an urban-type settlement) with a capacity of 2MW was the first step in a large-scale program for clean energy production facilities construction. Being a symbolic thousand-member enterprise of the Dnipropetrovsk Chamber of Commerce and Industry, the company's specialists became members of the Green Services Providers Committee under the DCCI. The Committee is systematically engaged to the development of skills, professional competencies and relations of providers with enterprises, government bodies, and institutions, external partners within the Program to support the «green» modernization of the Ukrainian economy (GIZ). The purpose of such joint work is development of high-quality «green» services in the region and Ukraine, assistance in optimizing energy costs, searching for environmental solutions for power supply for industrial and budget objects in the region. On this occasion, on November 28th, the Dnipropetrovsk CCI initiated press-tour to the company's objects, where invited leaders, engineers, members of the Chamber and the media for to introduce with a modern innovative enterprise. The guests got acquainted with the company thanks to the visit to the solar power station in Pidhorodne (an urban-type settlement) and directly to the production facilities of «EDS-Engineering LLC». Participants were able to see the existing solar power plant, to assess the quality of installation and exchange experience. 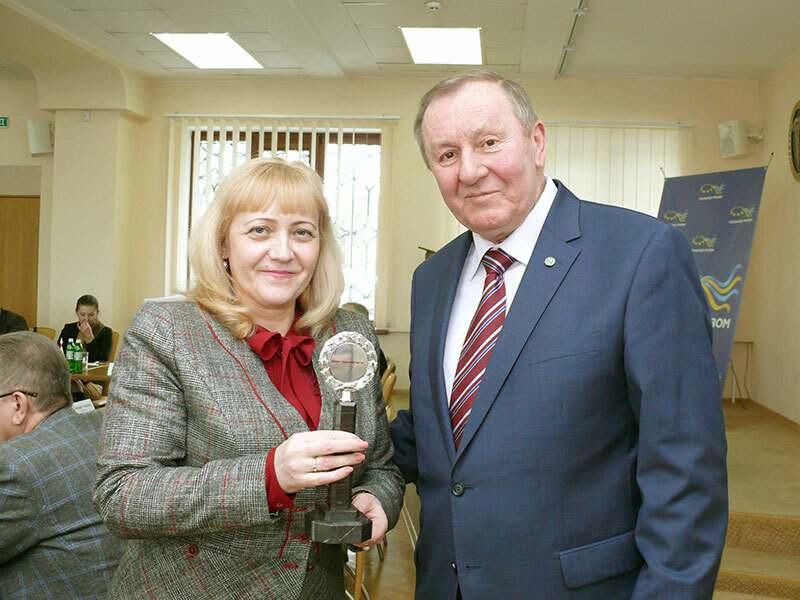 At the end of the event, the awarding ceremony of 1000th certificate of membership in the Dnipropetrovsk Chamber of Commerce and Industry and the Ukrainian Chamber of Commerce and Industry, as well as mutual communication and individual negotiations between enterprises on the basis of the Chamber took place. On November 23 - 24, the Business Forum «Management of Innovations» was held in the office of the Dnipropetrovsk Chamber of Commerce and Industry. It gathered more than 70 representativesof business and specialistsin the field of management systems. 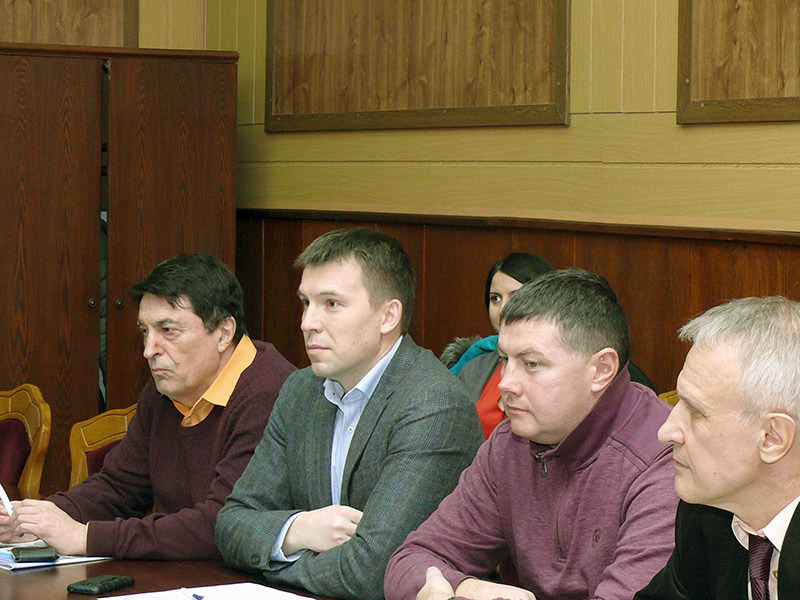 The meeting was organized in the framework of the «Green Chamber. The initiative for sustainable development» project, which is implemented by the German Society for International Cooperation (GIZ) within the Program to support the «green» modernization of the Ukrainian economy, in cooperation with «Technical and Management Services LLC» (TÜV SÜD official representative in Ukraine). During two days, participants had unique opportunity to get comprehensive information about the standards and the best world practices from experienced TÜV SÜD auditors. «I think that our Forum will perform the maximum tasks whether we can find effective mechanisms for implementing the decisions taken today. I am sure that the business forum «Management of Innovations» is a unique communication platform for specialists mostly in all kinds of activities. Make small, but real steps to address the most pressing issues – this is what we all need. Now the main form of innovation is not a new product, but a change in the organizational thinking of enterprises. This is due to the fact that the business world there is an urgent need for new standards and tools to increase competitiveness and strengthen leadership positions in the market», – noted Nina Alekhnovych, the first vice-president of the Dnipropetrovsk Chamber of Commerce & Industry. «Today we can observe real results of the «Green Chamber. The initiative for sustainable development» project activity. The Dnipropetrovsk region is the first in Ukraine where the process of development of the infrastructure for supporting the «green» modernization of the economy and sustainable development was initiated. It was the right choice. Thanks to the joint efforts of the Chamber, the Dnipropetrovsk Regional Council and the public organizations, the project is successful. We are looking for further cooperation, and Germany, from its part, is searching new ways to become a powerful energetic partner for Ukraine ». «We need to pay equal attention to the educational process, scientific and technical development. Our priority goal is to train specialists for Ukraine and Europe. But to achieve the European level without cooperation with the European countries in practice is virtually impossible. For the Metallurgical Academy, this was the push for cooperation with the Dnipropetrovsk Chamber of Commerce and Industry within the framework of the «Green Chamber. The initiative for sustainable development» project. Thanks to our joint efforts, we conducted advanced training in the field of «Energy management/audit», which gathered the best teachers of the Academy and experienced energy auditors – members of the Green Service Providers Committee under the Dnipropetrovsk CCI». Within the event program, the ceremony of certificates issue for trained energy auditors in the field of the advanced «Energy management/audit» course took place. There were no activists – members of the Green Services Providers Committee under the Dnipropetrovsk CCI, – who were left without attention. They received certificates of honor for assistance in organization of the above mentioned courses. After the Forum official part, series of lectures, seminars, and roundtables on topical policy issues in the field of energy audit and energy management were launched. A special bonus was a master class from the auditor. Such a high number of applications for participation in the forum showed not only a great interest in solving urgent issues in the framework of the forum, but also a large number of questions, the answers to which the participants tried to find. 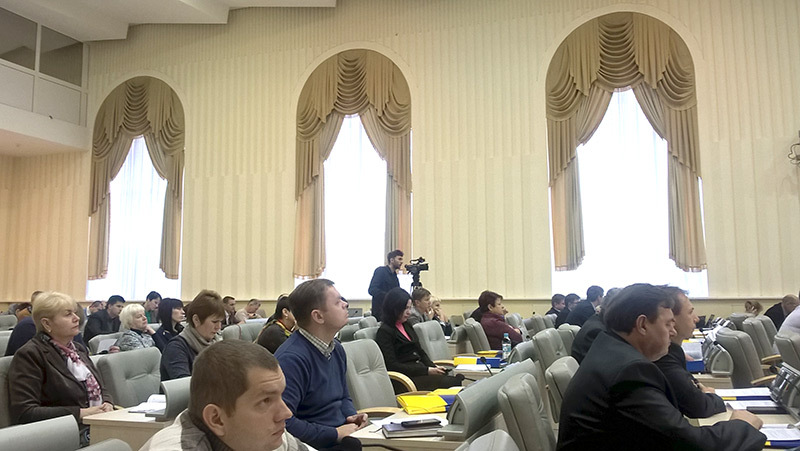 On November 22, Volodymyr Nichushkin, head of the Center for Resource Efficiency and Ecology of the Foreign Economic Relations Department of the Dnipropetrovsk CCI, took part in the conference «Strategy of Energy Saving, Energy Efficiency and Development of Renewable Energy Sources in the Dnipropetrovsk Region for 2018 – 2035». This conference was initiated by the Dnipropetrovsk Regional Council. The development of energy-saving technologies is becoming more urgent. This is due to the fact that the demand for energy is constantly growing, especially in the context of the active search for solutions to global problems related to economic prosperity, energy security and climate change worldwide. High energy consumption and low energy efficiency have become the main identifiers of the Ukrainian power grid. Necessity to avoid outdated technologies and the introduction of new approaches in the energy sector is obvious. All that has become ineffective, of course, needs to be replaced. The Dnipropetrovsk region is one of the most economically developed and industrial region of Ukraine, whose contribution to the Ukrainian economy exceeds 10%. At the same time, our region is among the largest consumers of fuel and energy resources in Ukraine, so the issue of sustainable energy development is extremely important. Today the scope of global investments to the energy efficiency and energy saving is significant, and their contribution to the development of energy demand is also great, like the primary resources.Unfortunately, the huge potential of energy efficiency is less noticeable than the reserves of oil fields. To correct this situation, the proper government policy is necessary. Local authorities should be leaders in the formation of permanent energy systems and combating climate change, because the most sensitive effects of these problems will be observed at the local level, and the energy sector is one of the first to experience their impacts. 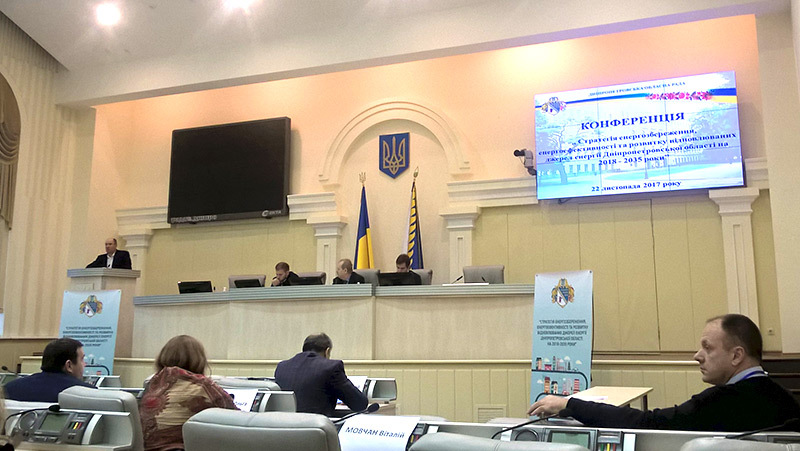 Understanding the urgent needs in solving energy issues, the Dnipropetrovsk Regional Council has developed a «Strategy of Energy Saving, Energy Efficiency and Development of Renewable Energy Sources in the Dnipropetrovsk Region for 2018 – 2035», which it plans to approve during the Session of the Council on December 1, 2017. The Strategy key goal is to systematize and coordinate activities of all communities and local governments towards system work for implementing energy saving measures, increasing of use of renewable energy sources in the overall balance of energy consumption, development of local communities' opportunities on the basis of a «green» economy, the contribution of individual communities to climate change. In general, the implementation of the Strategy is designed to achieve three strategic purposes: energy security, a «green» economy, and a clean environment. During the conference were presented different projects by domestic and international organizations working in the areas of energy efficiency, implementation of renewable and non-traditional energy sources, combating climate change in Ukraine. The Dnipropetrovsk Chamber of Commerce and Industry does not stand aside this process. Thanks to the partnership with the German Society for International Cooperation (GIZ) in the framework of the Program to support the «green» modernization of the Ukrainian economy and, the project «Green Chamber. The initiative for sustainable development», whose purpose is to create conditions for an active «green» modernization of enterprises and the formation of «green» services in the region, information about the Chamber’s work in this area had a great interest among the Conference participants. At the end of the event, the participants expressed their hopes that the Strategy goals will not be left only on paper but will be implemented. There are no doubts, that the price of failure is high. But in case of success, such excellent opportunities as the reducing energy consumption for the good of society, the environment and business are opened. 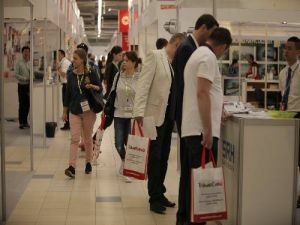 For the fourth time Dnipropetrovsk businessmen participate in the annual exhibition, which this year gathered 1,200 Chinese participants-manufacturers, 10,000 visitors from Ukraine, Hungary, the Czech Republic, Latvia and other European countries. For the second time the event was held at the exhibition centre PTAK Warsaw Expo in Warsaw. China Homelife Show is an effective platform for leading Chinese companies seeking to do business in Central & Eastern Europe. Buyers are guaranteed with the best quality and a wide variety of Chinese suppliers to choose from at the show. This well-known event presents a lucrative opportunity for importers to source high quality products directly from manufacturers at competitive prices. The exhibition was arranged by the Government of the Chinese Province Hangzhou, Meorient International Exhibition Co. Ltd, Shanghai, supported by the Warsaw Chamber of Commerce and Industry, the Association of Polish Media and in cooperation with international partners among which is the Dnipropetrovsk Chamber of Commerce and Industry. This year Chinese manufacturers introduced nearly 60 000 products in sections textiles and clothing, household appliances, building materials, lighting, household products, and gift products. Industrial products were presented as a part of additional sector of the exhibition, - China Machinex, - in the following categories: machines for manufacturing artificial materials, machines for food processing and packaging, construction and farm machinery, electrical equipment and tools, new energy and so on. Dnipropetrovsk delegation headed by the Regional Chamber of Commerce & Industry, was represented mainly by small and medium enterprises, including Dnepropetrovsk Furniture Factory PJSC, Pavlohradhimmash Plant PJSC, Agro-Soyuz Corporation LLC, Profile 1991 LLC, Energopolis PE LLC, Reklama-Ukraine LLC, Eco standard PE, Ukrainian Retail LLC, Karlsson Service station, Chinese trading house LLC, K.E.M.D LLC, Teplomyr Dnepr LLC. In order to provide with detailed information about the latest trends and rules how to work with Chinese producers, organizers held a seminar «Cooperation with China in trade». Within three years, Chambers of Commerce and Industry in cooperation with UkrSibbank work on improving qualifications of executives, managers, lawyers, accountants of enterprises engaged or planning to be engaged in foreign trade. Each meeting gathers a wide audience in industrial cities of Ukraine and has no analogues in it. The theme of this year's workshop - "How to export to different markets: choose a market and bring products there". 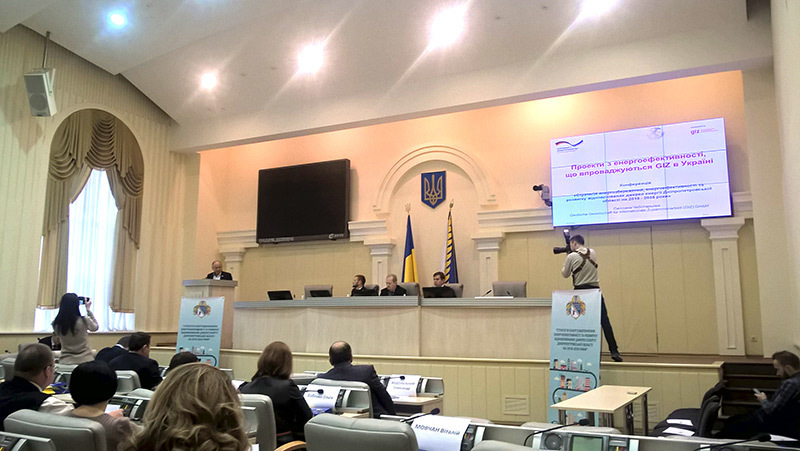 Dnipropetrovsk Chamber of Commerce and Industry acted as co-organizer of two events in Dnipro and Kryvyi Rih cities. Speakers: Nikolai Larin, project manager of the Association of Exporters and Importers "ZED", an expert in international trade and Vita Miroshnichenko, director and founder of "Capital" companies focused on the most important issues while conclusion of international contracts, how to check the reliability of counterparties, which countries are more attractive for Ukrainian exports, which supporting documents are required for customs clearance of exports and many other issues. During the events helpful links for exporters were provided among them well-known business resources, such as http://exporthelp.europa.eu; http://ec.europa.eu/eurostat; http://www.trademap.org. UkrSibbank representatives, in their turn, informed participants about popular banking services in the field of export and import operations. In particular, the bank offers full range of finance transactions, such as bank guarantees and letters of credit. We hope for a new meeting in the next year! Thus, the main contact parties, which will help to increase trade turnover between the Ukrainian Dnipro and the Turkish Samsun, will be regional Chambers of Commerce as well as the Carsamba Commodity Exchange. 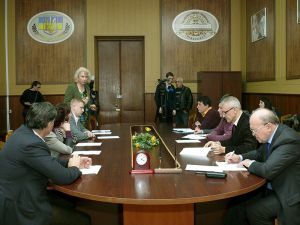 The signatures on the bilateral agreement on cooperation put the First Vice-President of the Dnipropetrovsk CCI Nina Alekhnovych and the Vice-President of The Carsamba Commodity Exchange Shevket Zesen within the program of the visit of the Turkish delegation to the city of Dnipro. Mutual interest to cooperation expressed 20 Samsun business representatives (Samsun is a city on the north coast of Turkey. It is the capital of Samsun Province and a major Black Sea port) and more than fifty enterprises of the Dnipropetrovsk region. The main areas of cooperation are food industry and wood processing. The Turkish entrepreneurs expressed interest in cooperation with local farmers, producers of wheat, barley, rye, oats, and corn. 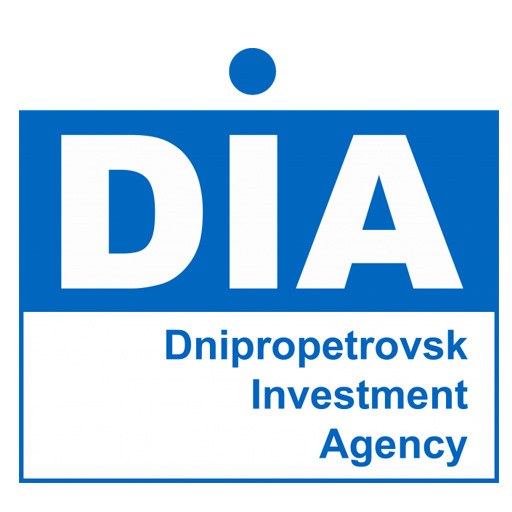 In turn, the Dnipro companies are willing to buy vegetables, fruits, nuts and fish products. The most fruitful meetings were with representatives of the Snack Production Corporation, supermarkets Varus and ATB. Info session devoted to this topic, invited to the German Westerham the BSO representatives from six Eastern Partnership countries: Armenia, Azerbaijan, Belarus, Georgia, Moldova and Ukraine within the East Invest 2 project. The meeting objective - learn to think strategically when managing internal and external risks for business support organizations. Senior executives of the Chambers of Commerce and other business support associations gathered for to exchange of successful experiences and problem solving which appear in their organizations activities. Together with the Ukrainian delegation meeting attended the First Vice President of the Dnipropetrovsk CCI Nina Alekhnovych. One of the strategic objectives of regional Chamber for the coming years is to create and support a favourable business environment, to deepen cooperation with foreign partners and international donor organizations; representation and advocacy of interests of members, providing new quality innovative services. In the short term, we plan to minimize the impact of negative factors on the diversification of services and to improve the relevance and quality of services, including shifting the balance of cash inflows towards the market and competitive services. During the meeting in the Westerham CCI Academy the First Vice-President of the Dnipropetrovsk CCI had an opportunity not only to discuss and adopt the experience of colleagues, but also to participate in practical group sessions aimed decide structural problems (cash flow, staff, membership…). 16/05/2017 Export correctly. What should be considered. The year 2016 was marked by the most important event for the Ukrainian economy - the entry into force of the FTA with the European Union. The results were not long in coming - Ukrainian exporters managed to increase deliveries to EU countries by 5%. In the year 2017 the Ukrainian business continues reorient towards new markets, so the improvement of exports is still in the spotlight of enterprises. 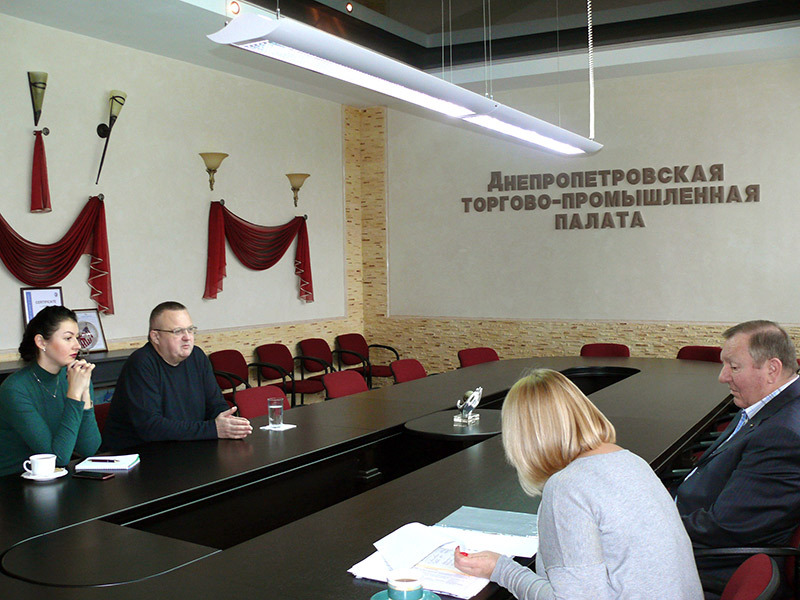 In order to facilitate the implementation of a successful export, in the end of April 2017 in office of the Dnipropetrovsk Chamber of Commerce & Industry heads and specialists of the enterprises of the Dnipropetrovsk region had a meeting with the project manager of the Association of Exporters and Importers "ZED", expert in the international trade Mykola Larin. How to use preferential regimes in trade, which give Ukraine 48 countries? How to avoid major problems in the organization of exports? How to assess the readiness of companies to export? How to choose the export market? How to determine the export of the product "portfolio" of products and many other issues were discussed during the meeting and worked out on practical examples. The organization of such training for practicing and aspiring exporters is part of an increase in exports of enterprises in general. The Lattelecom Company, - the largest telecommunications operator and leading IT-integrator in the Baltic countries at the end of April under the informational support of the Dnipropetrovsk Chamber of Commerce & Industry organized the workshop in the city of Dnipro "Data security in the digital world - challenges and opportunities of the future". Leading specialists in this area shared with the latest trends in cyber security, current specific problems with which have to deal IT-experts and how the cyberattacks process happens. The participants were provided with recommendations on the security infrastructure analysis and which errors are the most frequent. On a properly chosen cloud platform and service provider depends business development of a company. Meeting participants together with the speakers discussed the IT market, talked about the Lattelecom Company benefits and the modern market main trends, which correspond to the Latvian operator in the field of cloud services. There have been demonstrated the dynamics of the cloud services market in Ukraine. 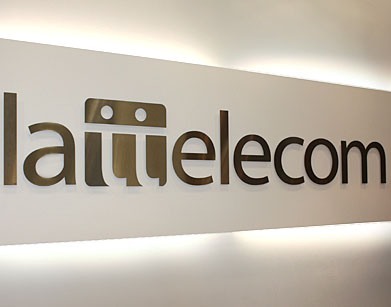 Very interesting was the report of ALLO Ukraine company representatives, which since 2014 has been actively using the Lattelecom Company services. 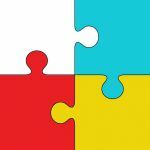 In particular, about the experience of ALLO Ukraine in integration of the Lattelecom Company solutions in their infrastructure, that accounts more than 400 objects. How much integration took time and which were expectations. But the results exceeded all expectations! Today, thanks to the transition to Lattelecom Company services, the IT department staffs have more time to work in the field of the company development, not in finding and eliminating routine problems. 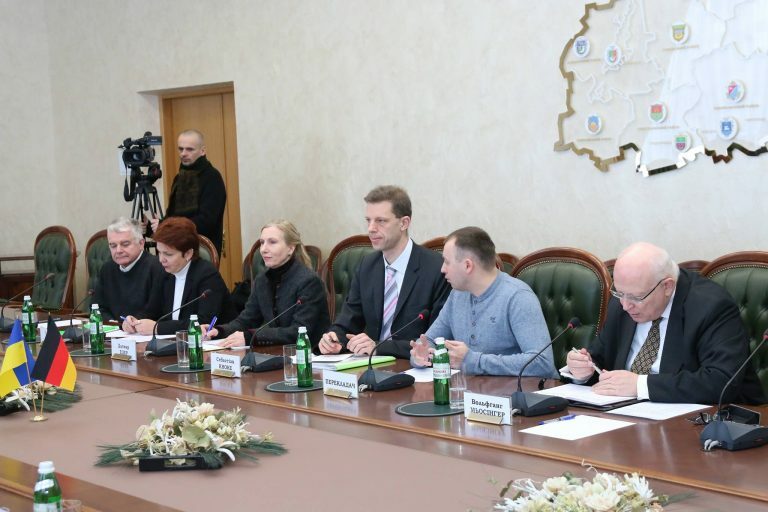 The Estonian delegation headed by the Ambassador Extraordinary and Plenipotentiary of the Embassy of the Republic of Estonia in Ukraine Gert Antsu visited the Dnipropetrovsk region. The program of the visit included a meeting with management of the Dnipropetrovsk Chamber of Commerce and Industry as well. During the conversation with the Estonian delegation, which besides the Ambassador, consisted of the First Secretary of the Embassy of the Republic of Estonia in Ukraine Helen Ennok and Project Coordinator, Humanitarian Assistance and Development Cooperation of the Embassy Anastasiia Mykhailova, President of the Dnipropetrovsk CCI Vitaliy Zhmurenko reminded the history of relations between regional business and Estonian partners, and confirmed readiness of the Dnipropetrovsk Chamber of Commerce and Industry to host the delegation of the Estonian businessmen during 2017 with arrangement of their presentations and visits to enterprises of Dnipro. Both parties discussed the necessity to intensify bilateral trade and economic relations. Taking into account the experience of Lithuanian Honorary Consulate, Honorary Consulate of Czech Republic, Austria, German Consulate General in Dnipro, whose activity in the region is very high, establishing of Estonian representative office will help with such cooperation. Traditionally Vitaliy Zhmurenko presented to the Ambassador export offers of the Dnipropetrovsk enterprises and asked to inform the Estonian businessmen about the readiness of our exporters to explore new markets. The Dnipropetrovsk Chamber of Commerce and Industry and the Dnipropetrovsk Regional Council with support of the German Government initiated a competition of resource-efficient initiatives among enterprises and scientists of the Dnipropetrovsk region «Green impulse. Green Chamber Award». 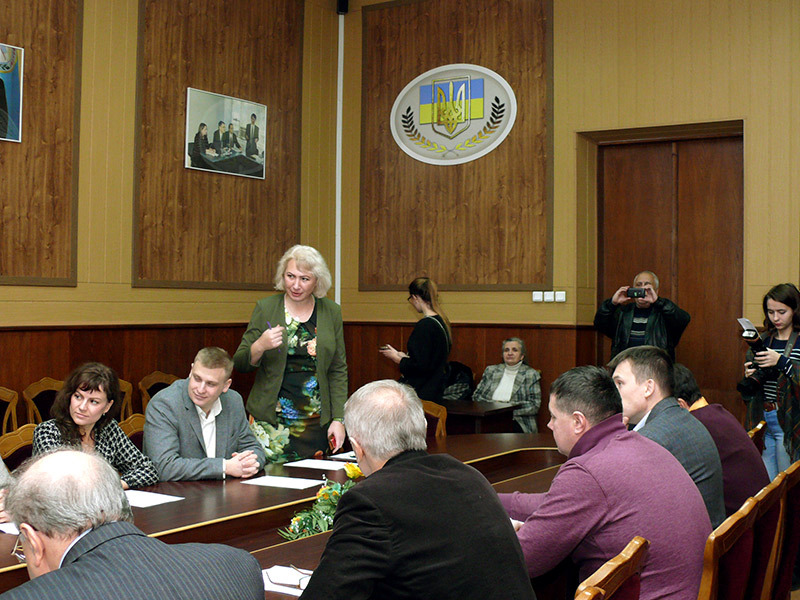 In consortium with the Dnipropetrovsk investment agency, the Council of rectors of higher educational institutions of the Dnipropetrovsk region, the Federation of organizations of employers in the Dnipropetrovsk region on November 15, 2016 it was announced the start of the event under the motto: «Efficiency, aimed at business development with concern for the environment». 35 enterprises and scientists of the region, which develop and implement projects and initiatives, aimed at efficient use of resources, applied for participation in the competition. Among them were large industrial enterprises, small and medium businesses - suppliers of resource-efficient equipment or energy and resource-efficient, environmental conservation services providers, as well as scientists. 26 applications were allowed for participation in accordance with the tender criteria. - the third place was awarded to a company AhroEnerhoPlus Ltd. with its project - «Substantiation of bio herbicidal energy crops growth technology for the purpose of recultivation of contaminated land and replacement of natural gas to biofuels». Director - Dmitry Demin. - the first place was taken by an engineering company «WTC Komplekt» with its project «SaveHouse Ukraine – Energy-efficient house». Director - Vadim Ryzhov. 4) In the category «The best project of a scientific institution» a winner was the National Metallurgical Academy of Ukraine with its project «Production and use of innovative carbon-based materials based on biomass and industrial waste of metal production to reduce cost for non-renewable energy sources and for the use in energy capacitive metal technologies». Vice-principal - Yuriy Proydak. 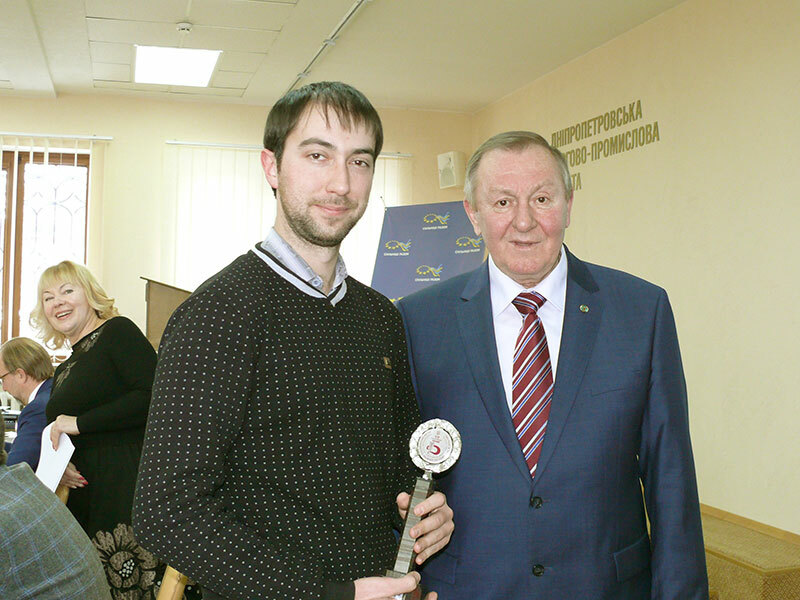 The winners were awarded by the deputy head of the Dnipropetrovsk regional council Vladimir Tyurin and the President of the Dnipropetrovsk Chamber of Commerce and Industry Vitaliy Zhmurenko during the final conference of the project of the Dnipropetrovsk Chamber of Commerce and Industry «Green Chamber. Initiative for sustainable development », implementation of which became possible by support of the Programme to support the green modernisation of the Ukrainian economy, which performed by the German Society for International Cooperation GIZ GmbH on behalf of the German Government. «There is the huge responsibility on the shoulders of the Dnipropetrovsk Chamber of Commerce and Industry, because this is almost the onliest organization in the region that can unite business. It is time to think about a new model of organization based on business needs and current trends» - said Gennady Chizhikov, President of the Ukrainian Chamber of Commerce and Industry, during a Council meeting held at the Dnipropetrovsk Chamber of Commerce and Industry. «A Сhamber of Commerce and Industry is the first one in a rank of influence among institutions which represent interests of businesses at the national and regional levels, constantly increasing its role as an arbitration organization. A Chamber supports effective communication between government and business as well. I am glad that Dnipropetrovsk authorities’ representatives quickly react to our suggestions and it has been accepted by the Regional Administration and Regional Council to support a number of activities planned for arrangement in Italy and South Korea. 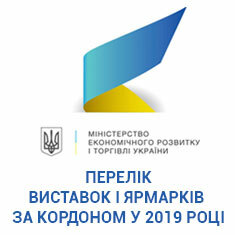 I congratulate Dnipropetrovsk entrepreneurs with a new achievement of your Chamber – among fifteen business support centers which will launch their activity soon in our country’s regions - a modern infrastructure for support of small and medium enterprises in the framework of the EU initiative - EU4BUSINESS will start its work at the Dnipropetrovsk CCI and in partnership with the Chamber» - added Gennady Chizhikov. Traditionally the report of the Dnipropetrovsk CCI’s President Vitaly Zhmurenko as for working results achieved in 2016 and activity plans for 2017 was listened during the Dnipropetrovsk Chamber of Commerce and Industry Council meeting. Participants talked and shared their opinions and made suggestions as for Chambers activity improvement. 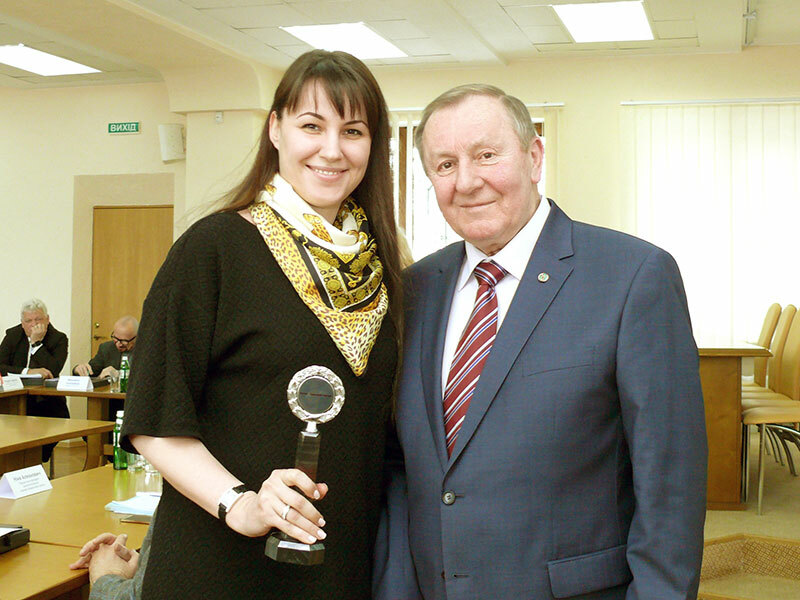 In general, the outgoing year turned out to be fruitful with achievements for the largest business association in Dnipropetrovsk. The Dnipropetrovsk CCI still remains a leader within the system of Chambers of Commerce and Industry according to many indicators. From year to year, it demonstrates its effective support to business of one of the most powerful regions of Ukraine. «The regional authority is ready for cooperation with business, the Chamber of Commerce and Industry and we do our best, using various levers of state support, so that you feel it» - said Oleh Kuzhman, First Deputy Head of the Dnipropetrovsk Regional State Administration in his greeting speech to Council members of the Dnipropetrovsk Chamber of Commerce and Industry. « Head of the Dnipropetrovsk Regional State Administration Valentyn Reznichenko declared the year 2017 as an export year for the region. We are ready to use all tools (presentations, workshops, investors support, studying the mechanism of compensation of interest rates for SMEs loans, etc.) for export and business growth then to provide additional revenue to the region»- said Oleh Kuzhman. Head of the Dnipropetrovsk regional council Glyb Prygunov assured that the Regional Council always demonstrated and will demonstrate its support for the Chamber of Commerce and Industry and business of the region as well. «We have the only aim and identical direction. We all work to strengthen the position of the Dnipropetrovsk region on the national level and international arena»- he emphasized. Council members – businessmen of the region expressed their opinion as for the last working year of the Chamber. In general, the activity of the Dnipropetrovsk Chamber of Commerce and Industry was recognized as one that met general objectives and concepts. All suggestions and remarks from business were listened and will be studied soon. A pleasant part of the meeting was distributing rewards to partners of the Dnipropetrovsk Chamber of Commerce and Industry. took place in the Dnipropetrovsk Chamber of Commerce & Industry and invited representatives of business, government, customs, fiscal authorities, experts in this field and the Chamber of Commerce & Industry representatives to discuss and share opinions on current problems and exports obstacles. Such meeting became possible thanks to cooperation between the Dnipropetrovsk Chamber of Commerce & Industry and the Institute for Economic Research and Policy Consulting (Kyiv) within the «Trade Facilitation Dialogue» project, which is supported by the European Union. In his greeting speech, President of the Dnipropetrovsk CCI Vitaliy Zhmurenko thanked to the project, speakers, regional customs and fiscal authorities for finding time to come and to listen to business, and, what is the most important, for their willingness to discuss and respond to current issues. «We continue to insist that such meetings should be regular and the Regional Chamber of Commerce & Industry is ready to be an initiator, organizer and a platform for such discussions» - said Vitaliy Zhmurenko. 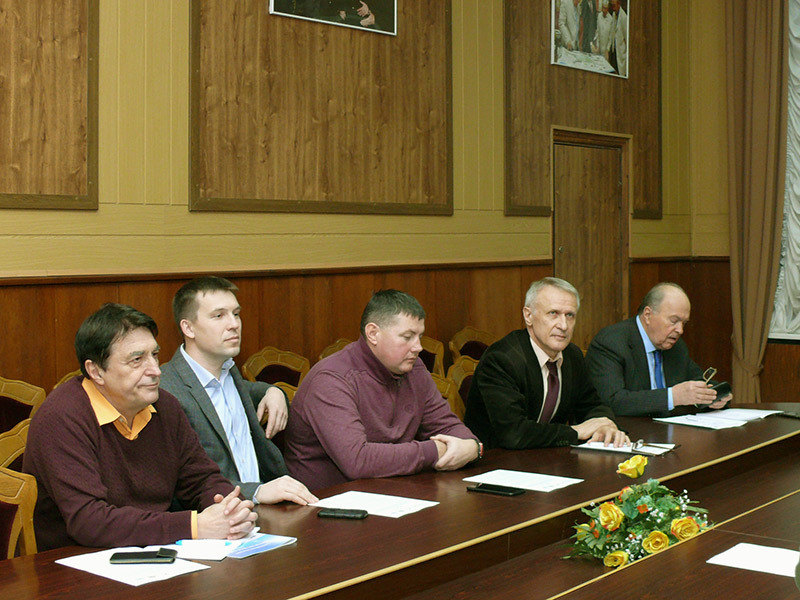 First Deputy Head of the Dnipropetrovsk Regional State Administration Oleg Kuzhman invited businesses to cooperate in the framework of newly established Council for Export Development, which included representatives of the Chamber of Commerce & Industry, taxation, customs, veterinary services and other government agencies related to export. The main task of the advisory body - first of all - to assist businesses in establishing new business contacts, as quickly as possible getting permits and efficiently solving other issues. «The authorities are ready for dialogue and make everything possible to reduce the influence of bureaucratic obstacles for entrepreneurs who want to develop export» – emphasized Mr. Kuzhman. The meeting moderator - Andriy Butin, а project representative, Senior Research Fellow of the Institute for Economic Research and Policy Consulting, - informed about the «Trade Facilitation Dialogue» project opportunities and achievements, presented results of a survey conducted among enterprises and which was prepares by the Institute to define main trade barriers. Among top three barriers to exports - unpredictable Ukrainian trade policy, insufficient quality level of transport infrastructure and unfavourable currency regulation. Among others negative factors for importers are the lack of transparency of customs value definition for imported goods; the complexity of customs and tax regulations, and again - unfavourable currency regulation. The meeting was attended by the deputy chief of the Dnipropetrovsk Customs Service of the State Fiscal Service of Ukraine in the Dnipropetrovsk region Igor Dyba and head of the Organization Department of the General Division of the State Fiscal Service of Ukraine in the Dnipropetrovsk region Manushak Osypova. Igor Dyba told about opportunities, advantages and disadvantages of existing today electronic system «Single Window», which was created to simplify the process and save time of passing goods through customs, answered to numerous questions. For information: Since the 1st of August 2016 it was implemented a new system of filing documents with the clearance of cargoes «Single Window» at the customs. Therefore, customs officers together with other government agencies involved in the control of imports, exports and transit, act cohesively using unified electronic system. 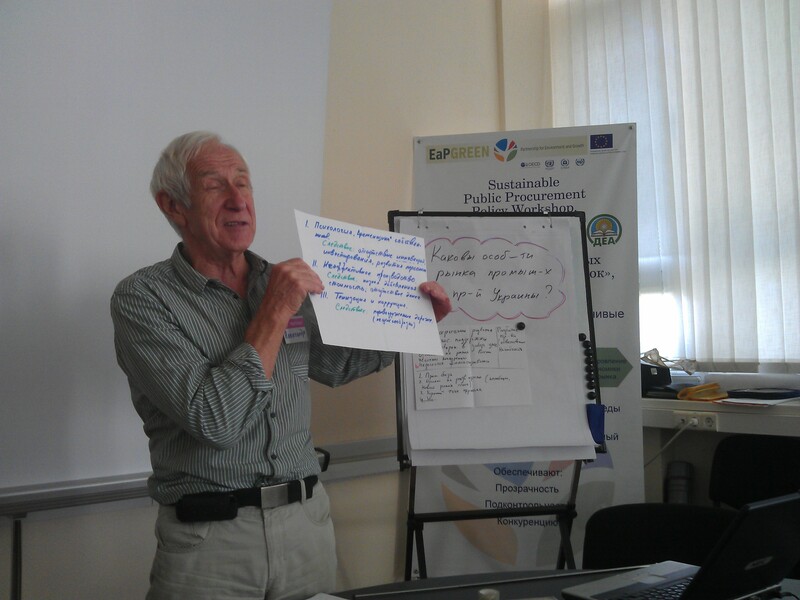 Manushak Osypova reported about regional fiscal authorities’ work, aimed to ensure revenues to budgets of all levels. She responded to a number of questions related to the tax law, invited business, if they have any questions to apply immediately to regional fiscal offices. Speakers' presentations from Kyiv were interesting and useful for business as well. Oleksiy Doroshenko - CEO of the Association of retail networks suppliers, deputy of the Kyiv regional council - answered questions and shared practical aspects, based on Ukrainian exporters’ experience, about how to get Ukrainian food products into the EU retail networks. Lev Bayazitov – a representative of the Deputy Chairman of the Interdepartmental Working Group on facilitation of international trade and logistics in Ukraine offered his vision of a mechanism of «Single Window» applied by the Customs. Also he told about current state, problems and prospects of implementation of the system. In the whole, the round table was attended by nearly fifty entrepreneurs from Dnipro, Kriviy Rih, Kamianske, Zhovty Vodi and Pavlohrad. Vice President, head of the Foreign Economic Relations Department of the Dnipropetrovsk Chamber of Commerce & Industry, head of the «Green Chamber - Initiative for Sustainable Development» project, which, since December 2015, is implemented by the Dnipropetrovsk Chamber of Commerce & Industry under the support of the Program of promoting green modernization of the Ukrainian economy, which is executed by the Deutsche Gesellschaft für Internationale Zusammenarbeit (GIZ) GmbH on behalf of the German Government, Sergiy Kucheryavenko took part in the meeting, which was held at the Dnipropetrovsk regional council. To discuss environmental issues and international cooperation in this area, there were invited head of the Dnipropetrovsk regional council Hlib Prygunov, First Secretary of the German Embassy in Ukraine Sebastian Knoke, Consul General of the Federal Republic of Germany in Donetsk with temporary location in the city of Dnipro Wolfgang Messinger, representatives of the Deutsche Gesellschaft für Internationale Zusammenarbeit (GIZ) GmbH, leaders of regional institutions. 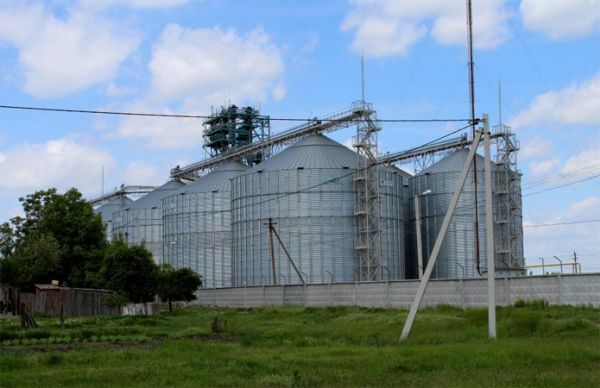 The Dnipropetrovsk region is the first among regions of Ukraine, where «green» modernization of the economy is implemented on industrial facilities. This European approach allows solve a number of industrial environmental problems in the region, to provide «green» light to foreign investment in Ukraine and to train Ukrainian enterprises to work considering world operational standards. Last year the Dnipropetrovsk delegation visited Germany, where gained the experience on the waste processing plants. German experience formed the basis of the regional solid waste management strategy. 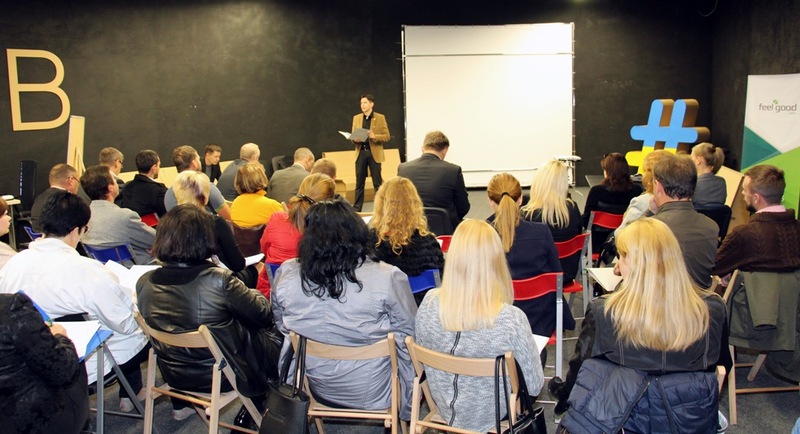 Series of activities were conducted: forums and seminars for businessmen, managers of municipal enterprises on which trained how to implement «green» technologies in the work of organizations and businesses. Another area of work towards «green» modernization is solution of the problem of Kryvbas highly mineralized mine waters. Already been developed technical terms for the project preparation entitled: «Optimization of mine water surplus discharges and their partial or total recycling». The final version of the technical terms was announced among process participants. In February will be announced the winners among the German companies, which will prepare technical and economic substantiation of the project, how safe and ecologically solve the highly mineralized waste water problem. Among the most acceptable options - water flushing and cleaning of the Ingulets River channel. The parties also discussed prospects of cooperation expanding. 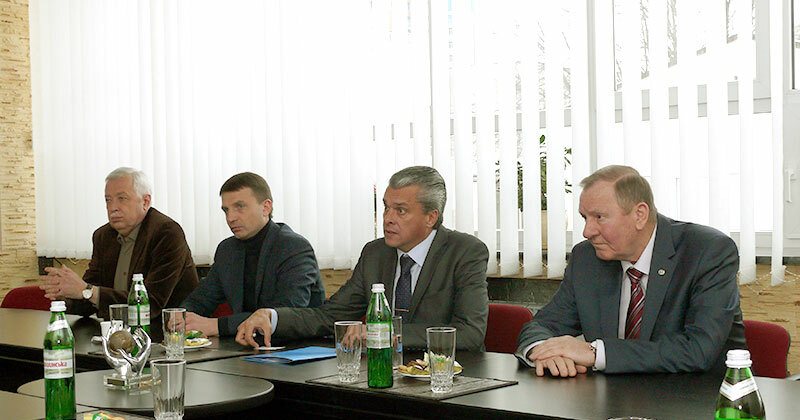 In particular, they talked about collaboration in the contest of energy saving projects of local governments and united local communities, creation by German businesses new jobs in the Dnipropetrovsk region, particularly in the agricultural sector, implementation of alternative facilities of energy by converting of plant waste to biofuel. In turn, the German party proposed participation in the new program for the know-how exchange between the cities of Ukraine and Germany. It provides for experience exchange in Ukrainian cities interested in projects in different spheres of life. For many years the environmental market is positioning itself as one of the most promising sectors of the economy, its formation is considered as one of the important directions in solving the problems of sustainable development. Business began to consider environmentally oriented production - as a promising area of development, and in some cases - as the only option for survival. Leading global manufacturers have in their assortment environmental features of famous brands, new companies are trying to gain a foothold in the market with innovative earth-friendly products and services. Aimed to support reputation a growing number of companies expand their environmental standards to the full chain of expensive production activities. 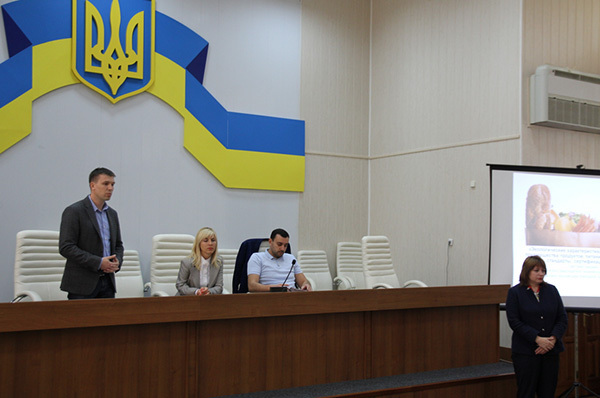 The training seminar that was devoted to topical for today subject and initiated by the Department of economic development of the Dnipropetrovsk regional stage administration, held in the Dnipro district. The Dnipropetrovsk Chamber of Commerce & Industry - the organizer of the seminar, - invited more than fifty entrepreneurs who want to work knowingly considering the current trends and consumers’ demands. The event speaker and moderator, - Svitlana Berzina, an international environmental auditor, vice president of the Institute for environmental management and sustainable environmental management, deputy head of the National Technical Committee for Standardization TC 82 “Protection of the environment”, Kyiv, - informed the participants about principles and teaching methods of organic production and organic market trends in Ukraine and in the world as well as the current legislation, rules (standards), methods of evaluation and the best practices of organically certified products promotion on national and international markets. Special attention was paid to appliance of organic labeling rules and business entities responsibilities for their violations. Also during the event were considered issues of environmental certification rules and environmental labeling principles and declarations appliance. The results of comparative analysis of the requirements of organic standards and ecological criteria that establish requirements for environmental certification of food products in order to implement environmental labeling were also discussed. “And organic and environmental certification systems are based on the method of evaluating lifecycle and improved product characteristics. However, there are some fundamental differences in requirements. It is important to understand: standards of these systems are not mutually exclusive, but differ in their requirements for production processes, products certification and evaluation methods. Which ones to choose for itself determine the manufacturer, considering its technical and technological capabilities, combined with the ability to provide the necessary supplies of organic raw materials or achievement of compliance with environmental standards. Any way, it is important to understand the main thing - it is a voluntary standard and because of it is voluntary, not everyone can fulfill its requirements. The voluntary standard does not duplicate government regulations, it allows identify better product quality and improved safety indicators, supporting its competitive advantages.” - said the speaker. Head of the Division of the Economic Development Department of the Dnipropetrovsk Regional State Administration Alla Kefel informed participants about the implementation of regional programs for SMEs in the Dnipropetrovsk region in the years 2015-2016, which initiated by the regional state administration, as well as the next steps in the program implementation scheduled in cooperation with the Dnipropetrovsk Chamber of Commerce & Industry in Nikopol and Tsarychanka. Vice President, head of the Foreign Economic Relations Department of the Dnipropetrovsk Chamber of Commerce & Industry Sergiy Kucheryavenko traditionally called entrepreneurs use the opportunities offered today from both the regional authorities and the Chamber of Commerce as well as from international donor organizations, which work in our region today, which in turn, configured to support Ukrainian manufacturers in their aspirations to implement quality standards in their work. Vice President of the Dnipropetrovsk Chamber of Commerce & Industry Sergiy Kucheryavenko called the audience - members of the round table held in the city of Dnipro, and was devoted to challenges and risks of regional green economy, to use advantages of already existing tools offered by the Dnipropetrovsk Chamber of Commerce & Industry aimed to assist businesses to conduct energy efficiency on the enterprises. Round table "Green Economy: Risks and Challenges" launched of a cycle of activities under the project "Creation of favorable conditions for green economic modernization in the Dnipropetrovsk region", implemented by the NGO "Green World - Friends of the Earth" with the support of the German International Cooperation Agency GIZ, and in cooperation with the Dnipropetrovsk Regional State Administration and Dnipropetrovsk regional council. The project is a part of the promotion of green modernization of the Ukrainian economy, which implemented by the German International Cooperation Agency GIZ. Oleksiy Anhurets, project coordinator and moderator of the event, said: “Management system, that still dominates in the Dnipropetrovsk region was created in Soviet industrialization period and does not meet modern conditions. Green economy - as a style of management that provides welfare through significant reduction of risks of environmental change may be the new model that will allow Ukraine to become competitive in the modern world”. Peter Shmal, Deputy Consul General of Germany in Donetsk, by his speech has set up audience for fruitful work. Ruslan Strilets, director of environment and natural resources department of the Dnipropetrovsk Regional State Administration, spoke about new opportunities for Ukrainian industry, about cooperation with the government institutions. During meeting were discussed the regulatory base existing barriers which constrain the green economy modernization. The main meeting feature - under the one roof gathered the green movement leading experts together with representatives of top 20 areas polluters which became active participants in discussion of barriers of green economy implementation. 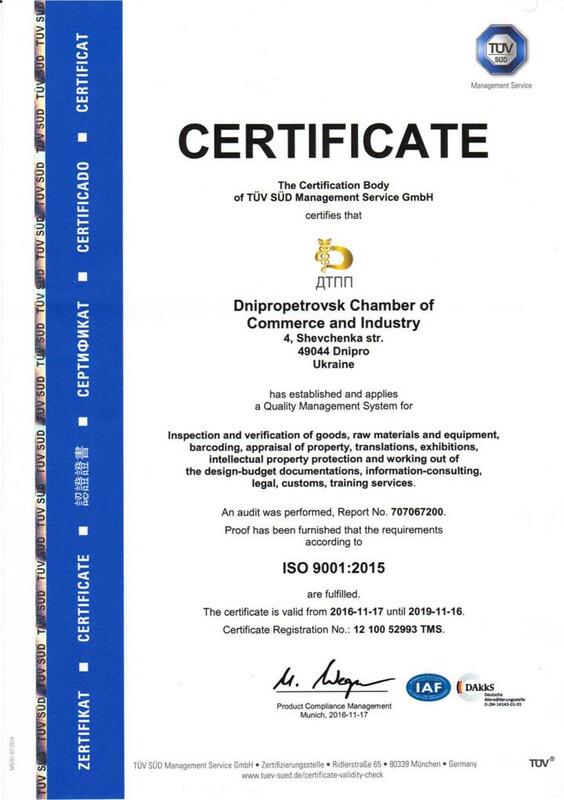 We congratulate all of us with the next significant achievement - the recognition of the Dnipropetrovsk Chamber of Commerce & Industry as an organization for which the quality of services is a fundamental principle and which complies with the international standard ISO 9001:2015. We wish to the whole Chambers’ team creative inspiration and further professional achievements! 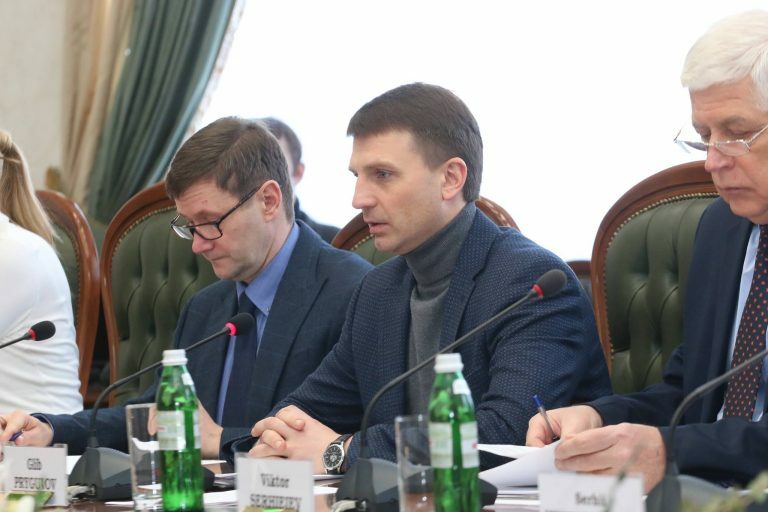 Regional energy service companies as well as CCI experts, which are involved to the providing of energy saving and environmental protection services, gathered again in the Dnipropetrovsk Chamber of Commerce & Industry office to analyze green services market. 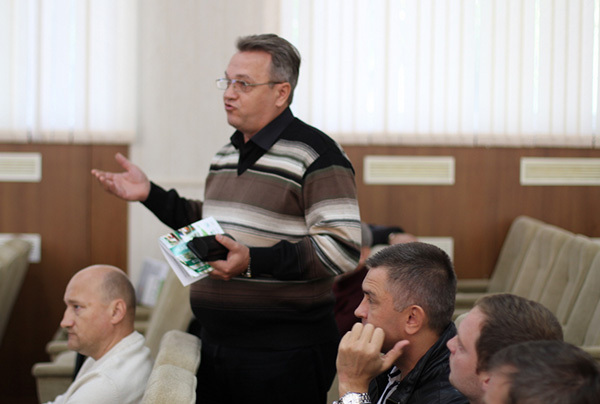 They learned to search target audience, potential customers, to analyze their risks and strengths in constructing dialogue with prospective customers, discussed prospects of joint projects realization and integrated positioning of the green services of participants of the "Green Chamber - Initiative for Sustainable Development" project, which, since December 2015, is implemented by the Dnipropetrovsk Chamber of Commerce & Industry under the support of the Program of promoting green modernization of the Ukrainian economy, which is executed by the Deutsche Gesellschaft für Internationale Zusammenarbeit (GIZ) GmbH on behalf of the German Government. For Ukraine "coming" of these concepts in our daily lives (especially in energy management, energy audit, energy consulting, green services) connected on the one hand, - with a transition of national economy to a market economy, and more closely integration of our country into the European and global economic processes, - on the other hand, in view of the experience of energy crisis, dependence on energy imports (oil, gas). Today the Dnipropetrovsk Chamber of Commerce & Industry is one of key regional partners of the Program of promoting green modernization of the Ukrainian economy, implemented by the German International Cooperation GIZ on behalf of the German Federal Government, is part of the green process and promotion of its basic principles in the Dnipropetrovsk region. Unfavorable ecological situation in our region, lack of cheap resources has forced many managers to think about tomorrow. We analyzed the possibilities and plans of activities under the Ukrainian CCI strategy 2020 and developed a services portfolio, among others the most perspective we have identified development services in the field of environment and energy efficiency. Since December 2015, under support of the German International Cooperation GIZ started the Dnipropetrovsk CCI project "Green Chamber - Initiative for Sustainable Development", developed in accordance with the proposals of regional enterprises. Our main tasks in framework of the project - to increase potential of the Dnipropetrovsk CCI - as a platform for building effective dialogue of green services market participants: providers and enterprises, consumers of these services as well as to expand the range of specialized services of the Chamber, actively contributing to promotion of green economy idea and formation of a regional green services market. Since July 2016 with the purpose of consistent proactive work with companies and government agencies in the region, for improving of environmental standards and use of modern technologies, European practices of environmental management, elimination of technical barriers to the development of export potential of companies in the region in the Dnipropetrovsk CCI was established the Centre of resource efficiency and ecology. Report on the costs of environmental protection and environmental payments (Form №1 - environmental costs). Experts and partners of the Centre of resource efficiency and ecology of the Dnipropetrovsk Chamber of Commerce & Industry promptly provide advice and services regarding of ecological components of the enterprises activity, on issues of ecological certification and labeling products, building of the system of energy management, of expertise - energy audit in the following areas: heating, ventilation and air conditioning, water supply and water preparation, wastewater treatment, power supply, control and measuring devices and equipment, gas supply, technical diagnostics of energy infrastructure and neighboring industry and administrative buildings. Contacts of the Centre of resource efficiency and ecology of the Dnipropetrovsk Chamber of Commerce & Industry: tel/fax: +380 (56) 374-94-09, greenchamber@dcci.org.ua. - is the next topic chosen for discussion by business representatives within the Trade Facilitation Dialogue, implemented by the Institute for Economic Research and Policy Consulting (Kyiv), supported by the European Union. 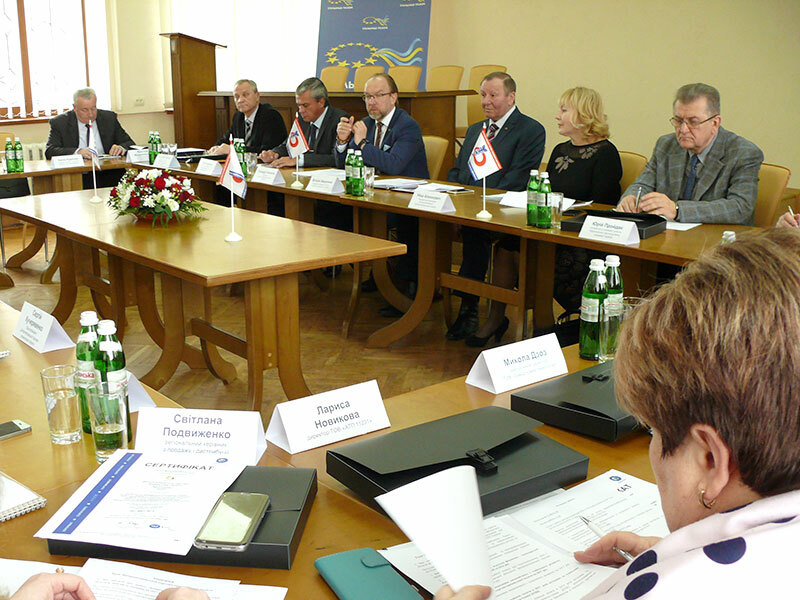 The Dnipropetrovsk Chamber of Commerce and Industry acted traditionally as a platform for carrying out the dialogue. Nina Alekhnovych, the First Vice President of the Dnipropetrovsk Chamber of Commerce and Industry, in her greeting to participants, thanked businessmen for their activity as well as speakers of the project for their effective support to local entrepreneurs. «Such projects give an opportunity to obtain new knowledge from leading experts in the European integration process», - she said. The workshop, dedicated to the use of trade defence instruments (anti-dumping, countervailing and special safeguard measures), gathered more than 30 regional participants. Olga Mozgova, a project manager of UkrAgroConsult Center Ltd, Andriy Butin, a representative of the Institute for Economic Research and Policy Consulting, Maria Zametalina, a specialist of requests and notifications department of market access and interaction with the WTO of the Ministry of Economic Development and Trade of Ukraine – were speakers of the seminar, who shared with relevant analytical data information as for the Ukrainian agricultural products export structure; demonstrated samples of anti-dumping investigations; informed about measures taken by our state to protect Ukrainian economic entities in trade defence investigations; WTO requirements to ensure the transparency of trade policy, which is one of the most important factors for foreign investors; Ukraine's achievements in the principle of transparency correspondence. Entrepreneurs actively used the opportunity to ask questions, they were interested in, and to get competent answers during the training. 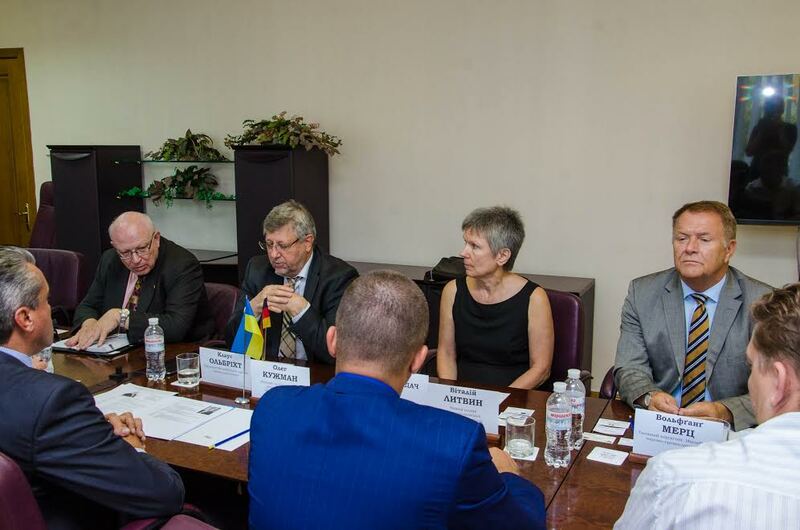 As it was specially agreed during the previous meeting the German delegation headed by executive management of the Magdeburg Chamber of Commerce and Industry visited Dnipro and Kryvyi Rih in the mid of September for discussion next year cooperation perspectives. Extensive program of the visit confirmed mutual interest in cooperation. Meaningful meeting with Oleh Kuzhman, the First Deputy head of Dnipropetrovsk Regional State Administration, administration of the National Mining University, Wolfgang Messinger, Consul General of the Federal Republic of Germany in Donetsk with temporary location in Dnipro and the number of Ukrainian enterprises interested in cooperation is the main indicator of the urgency of continuing and intensifying the dialogue of Chambers, business and government of both regions. Visiting such industrial enterprises as INTERPIPE NTRP, HeidelbergCement Ukraine, Elektrograd, Pivdennyi GZK gave the possibility to be acquainted with manufacturing process and discuss about certain lines of business cooperation. It was agreed that in the framework of tentative agreement with Elektrograd management, the German party will purchase equipment of Ukrainian production. Moreover, it was discussed about cooperation in the production of rolls during the meeting at INTERPIPE NTRP. Chief executive officers of Magdeburg and Dnipropetrovsk CCI agreed to continue cooperation in the framework of the both Chambers common project to provide temporary employment of Ukrainian specialists at enterprises of Saxony-Anhalt. Vitaliy Zhmurenko assured colleagues that the Dnipropetrovsk Chamber of Commerce and Industry will continue to work in this sphere involving all possible resources in this process. 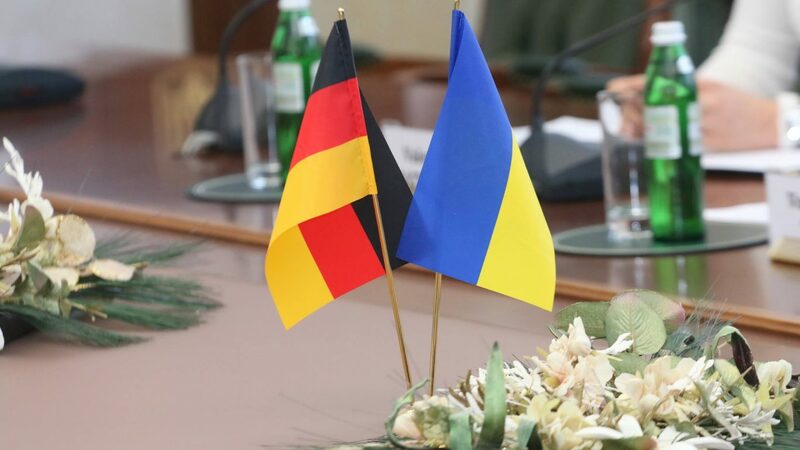 Of course, it will be difficult to implement without support of the Consulate General of the Federal Republic of Germany in Donetsk with temporary location in Dnipro. The Parties agreed to inform periodically Wolfgang Messinger, Consul General of the Federal Republic of Germany in Donetsk with temporary location in Dnipro, about situations in this sector. Furthermore, it was discussed about organization a visit of two German experts to conduct monitoring of the situation in the field of dual vocational education in the region which provides business training of specialists needed for business. Experience of Germany in this field is the fact that it is important to join efforts of business, scientists and government to achieve tangible results. Also it was agreed that representatives of the National Mining University and the Dnipropetrovsk Chamber of Commerce & Industry will take training courses in the field of certification according to German standards. Every year in early September it is a good tradition to congratulate the best leaders of small and medium-sized businesses due to their constant work, which is formed and strengthened the foundation of the regional economy. 2016 is not a year of exceptions. Grand meeting on the occasion of the professional holiday held in Dnipro, in the restaurant complex “Hutir”. Representatives of regional and municipal authorities, the Dnipropetrovsk Chamber of Commerce & Industry as well as the Federation of Employers of the region gathered more than five hundred executives of leading regional enterprises in one place. 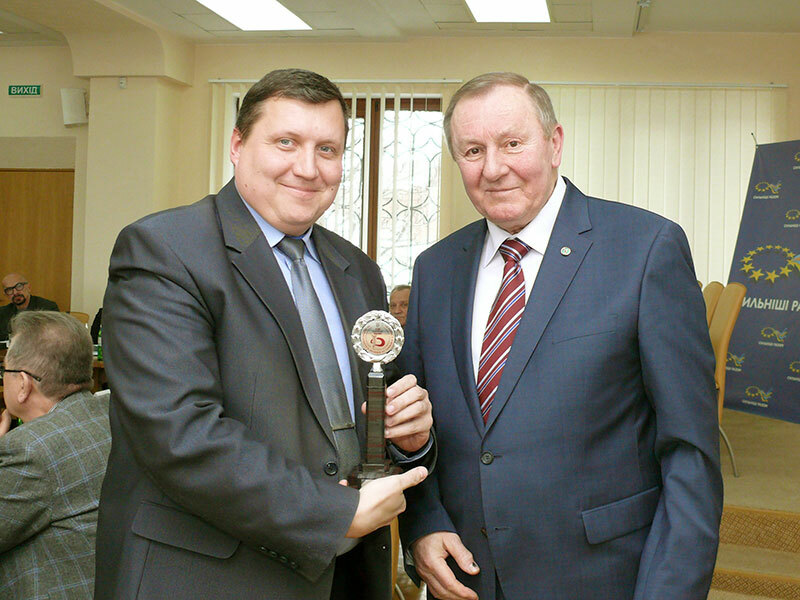 - the badge of honor of the Dnipropetrovsk CCI “Mercury of Prydniprovya” to Stanislav Kasian-Shainsky, director of “Kresko” LLC. again discussed during the next joint event arranged by the Dnipropetrovsk Chamber of Commerce & Industry in cooperation with the Institute for Economic Research and Policy Consulting (IER) within the “Trade Facilitation Dialogue” project supported by the European Union. Relevance and necessity of such meetings confirmed every time by high interest from the businesses to the duty event. This seminar wasn’t exception. Traditional high number of participants showed: we are going in the right direction, helping businesses to navigate in the realities of modern preparation of products for export to the European market. Leading experts and consultants, including Valeriy Piatnytskyi, Advisor to the Prime - Minister of Ukraine; Svitlana Zaitseva and Andrii Butin Senior Researchers of the Institute for Economic Research and Policy Consulting as well as the independent expert Vitaly Bashynsky presented, discussed and debated. In view of the relevance of the issue, spoke about sanitary, veterinary and phytosanitary rules and regulations; about the obstacles on the way of Ukrainian exporters and their products to foreign markets. Separately were discussed business opportunities by means of trade promotion tools of the institute of authorized economic operator. Practical training for energy service companies and CCI representatives, aimed to train experts, which are involved in providing of resource and energy saving services for regional industrial enterprises, to modern approaches to communicate with potential customers, took place in the Dnipropetrovsk Chamber of Commerce & Industry office. The event became possible due to the support of the Program promoting green modernization of the Ukrainian economy, which is performed by the Deutsche Gesellschaft für Internationale Zusammenarbeit (GIZ) GmbH on behalf of the German Government. Representatives of dozen companies, engaged in providing of consulting services on energy efficiency and the environment, alternative energy and high technology, trained to build marketing strategies of their businesses, studied, analyzed the market, segmented and identified its most attractive destinations. The educational program was created on the basis of experience of the practical examples of the market leaders’ work during the discussions in groups. The speaker, - Oleksandr Ladygin, the Head of Training Department of the "Gestalt Consulting Group", - elaborated on the importance of operational marketing: its components, determining the value of services and price factors that further will affect costs, competition and the possibility of customers. Over the last few years Ukrainian exports have been going through difficult times. We lost the largest market and production capacity for traditional exports, world market was also unfavourable. Due to these and other factors Ukrainian exports significantly reduced. According to the State Statistics Service of Ukraine, in January - May 2016 Ukrainian exports to the EU increased by 4.5% compared with the same period of the last year and amounted to almost 40% of total exports. According to the same period, imports from the EU countries increased by 3.3%, that is 44.6% of total Ukrainian imports. Statistics for the first five months of the DCFTA+ agreement action between Ukraine and the EU shows that the balance of trade between Ukraine and the EU remains negative and is more than $ 1 billion. The overall trade balance is also negative. Imports for the first five months of this year dominated by exports to 694 million USD. Last year during the same period exports were low not much (128 million dollars), but dominated by imports. On the other hand, Ukrainian exports decreased not as fast as last year. During January-May 2016 amounted to 11.5% reduction when compared with the same period last year. In January-May 2015 overall decline in exports was 34.6%. According to the State Statistics Service of Ukraine, exports to CIS countries amounted to 20% of the total. Among which, Russia – still is the main trading partner of Ukraine - accounted for 8.8%. Imports from Russia amount to 12% of total imports. The export to Russia decreased by 36.2% and imports - by 44.2%. Russia remains the leading trade partner of Ukraine, if we consider individual countries. But the volume of exports and imports on the Russian direction is by an order lower than the volume of trade with the EU (as a union of countries). As a standalone country, Russia remains the leading trade partner of Ukraine. But the exports and imports total volume to the Russia is much lower than the volume of trade with the EU (as a union of countries). The main items of Ukrainian exports are metals (3.124 billion USD, including ferrous metals - 2.714 billion dollars), products of vegetable origin (2.934 billion USD, including grain - 2.327 billion USD) and engineering products (1.401 billion USD). Exports of metals decrease (by over 26% compared with January-May 2015), and exports of agricultural products grow (by 1.7%). The main Ukrainian imports items remain engineering products (2.767 billion USD), fuel products, - gas and oil, which for the first five months of this year Ukraine has acquired on 2.4 billion USD. To consider the Ukrainian products competitive on the European market is definitely very difficult. Therein the biggest challenge associated with the DCFTA+ for the Ukrainian manufacturer – to make our product so qualitatively, so they could pass through the strictest competition. If Ukrainian producers follow the rules and regulations both in production and in sales, they will be able to look forward on success. This and other equally important issues for entrepreneurs, which are already export or just planning to carry out foreign trade activities, discussed participants of the meeting in the Dnipropetrovsk CCI with the participation of a leading expert in this area Mykola Larin. Workshop participants, the representatives of twenty regional enterprises got practical advices how to work under the DCFTA+, the regime of general preferences, about existing development tools for businesses. How to enter the foreign trade contract profitably? What to look for? Risks basic mistakes. All of these issues were also discussed in framework of the workshop. The next East Invest 2 BSO Academy, devoted to discussion of effective model of a sustainable BSO model, its Income generation and services formation, took place at the IHK Westerham training centre, Germany. 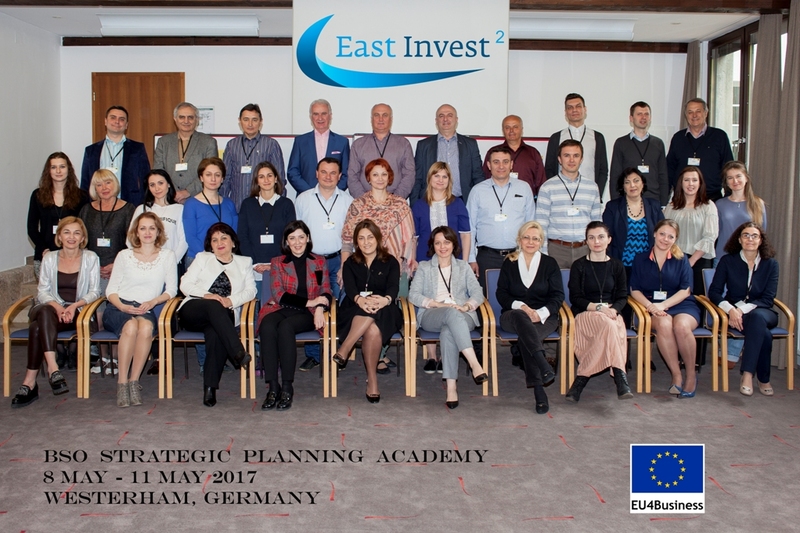 The East Invest 2 Academy is a practice-based training designed specifically for executives and directors from business support organizations (BSOs) and SME associations from the 6 Eastern Partnership (EaP) countries: Armenia, Azerbaijan, Belarus, Georgia, Moldova and Ukraine. bringing together the network - to find project partners; to benchmark; to sound out new ideas! In order to expand cooperation, experience exchange with colleagues, obtaining new knowledge for later use in its activity, Dnipropetrovsk Chamber of Commerce & Industry delegated to this education head of the sector of foreign relations and investments of FERD Ms. Olga Bezchasna. More than thirty representatives of business associations from Armenia, Azerbaijan, Belarus, Georgia, Moldova and Ukraine gathered to discuss and listen to the reports from leading European experts in consulting and marketing areas relating, in particular, the definition of new services and tools to attract new members of chambers and associations, improving and optimizing of existing services. definition of individual measures to promote business with individual approach to every member of the Chamber. European speakers provided the latest information on the conditions and requirements of imports to the EU by demonstrating in practice the work of online search resources, study and analysis of market capacity and volumes on different products in various countries. This is how we can characterize long-term cooperation between Dnipropetrovsk and Magdeburg Chambers of Commerce & Industry, the official beginning of which was laid in 2009 when the Chambers signed a bilateral cooperation agreement. Regarding the beginning of friendship and trusted relations - all started much earlier. 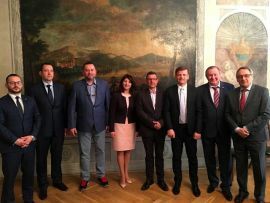 A regular meeting between old friends - the leaders of Dnipropetrovsk and Magdeburg Chambers of Commerce & Industry – Mr. Vitaliy Zhmurenko and Mr. Wolfgang Maerz, - took place in the framework of the visit of regional delegation to Potsdam to the international partnership forum for environmental and energy technologies «Green Ventures». The result of the negotiations - the delegation from Magdeburg will visit the Dnipro in September this year! The Chamber leaders also agreed the activity continuation of Ukrainian-German Cooperation Office (BCO) in the Dnipropetrovsk Chamber of Commerce & Industry, the main purpose of which traditionally is to provide effective assistance to businesses and organizations in Germany and in Ukraine in the sphere of business relations and cooperation development, training personnel issues, etc. Apart from meeting with Magdeburg colleagues, President of Dnipropetrovsk CCI held conversations with the leaders and experts of Potsdam and Cottbus Chambers of Commerce and Industry. Within the «Green Ventures» forum, Dnipropetrovsk delegation had the opportunity to learn the Brandenburg regional strategy in terms of exports and efficient green economy. The members of the Green Services Providers Committee of Dnipropetrovsk CCI had the opportunity to learn the experience of Potsdam CCI in the sphere of the specialized promotional activities organization, which take place with the active support of the leaders of the Government of the Brandenburg federal state, and aimed for developing of the strategic direction of German industry - the green economy, sustainable energy and environmental protection standards improving. The President of Potsdam CCI Mrs. Beate Fernengel and several CEOs - Potsdam CCI partners, are going to visit the Dnipro this autumn and hold number of meetings with the leaders of the light industry enterprises and universities - members of Dnipropetrovsk CCI, regional and municipal authorities. When Ukraine declared independence, Pakistan was among the first countries to recognize it. The process of establishing formal diplomatic relations was initiated in 1992 and in 1997, Embassy of Pakistan in Kyiv and Embassy of Ukraine in Islamabad were established. Pakistan and Ukraine have friendly and cooperative relations. However, I believe there is a huge potential that still needs to be tapped to further strengthen our bilateral cooperation. This potential exists in both political as well as economic areas. In this context, our two countries have signed a number of agreements including agreements on trade and economic cooperation, avoidance of double taxation, and establishment of a Joint Inter-Governmental Commission. Many more agreements are being negotiated to provide the basic framework required for deepening our relationship in diverse areas. I see huge prospects for enhancing our bilateral economic cooperation and, as Ambassador of Pakistan in Ukraine, I have been working to bring people of our two countries closer on all fronts including particularly in area of trade and business. As part of efforts to promote bilateral trade and commercial relationship, Pakistan-Ukraine Business Council (PUBC) under Federation of Pakistan Chamber of Commerce and Industry (FPCCI) has been established. The PUBC is a useful platform facilitating interaction among business community in both countries. We are also in the process of appointing a Pakistani Honorary Consul in Kherson and Odessa regions of Ukraine to promote bilateral trade. Meanwhile, exchange of visits by business community is being facilitated. The Embassy has been working with Ukrainian Chamber of Commerce and Industry and other trade related bodies to encourage and facilitate participation of Ukrainian businesspersons to exhibitions and trade fairs held in Pakistan. We are also working with FPCCI to facilitate visits by Pakistani business community to Ukraine. Pakistan’s major export items to Ukraine include textile goods, rice and fresh fruits mainly mandarin. The imports from Ukraine range from oil seeds like sun flower, iron and steel including scrap, wheat and its by-products and fertilizer and chemicals. The total trade volume between the two countries rade in recent years has been on the increase. Currently the annual trade turnover stands at around US$ 400 million but there is huge potential that remains untapped. I would like to emphasize that Pakistan produces a range of high quality products that can be marketed in Ukraine. Similarly Ukrainian products have the potential to find a market in Pakistan. On the investment side, Pakistan would like Ukrainian companies to come and benefit from the opportunities and potential which Pakistan’s growing economy offers particularly in power sector, oil & gas, infrastructure, housing, healthcare, education, information technologies and renewable energy and environmental technologies. Pakistan Board of Investment has been mandated to facilitate and assist foreign investors. Board of Investment will hold investors’ hand to fast track projects under one window. We continue efforts to broaden bilateral academic exchange and collaboration in the field of research, science and technology. In this context, Embassy is pursuing early finalization of Agreement on Cooperation in the Field of Education and Agreement on Equivalence of Degrees to facilitate student and academic exchange between the two countries. In addition, we are working on establishing academic linkages between the institutions of higher learning in both countries. Embassy would focus on facilitating such linkages between universities and institutions of higher education in Dnipropetrovsk regions and their counterpart institutions in Pakistan. Pakistan and Ukraine are also in the process of negotiating a cultural cooperation agreement that would provide a framework for enhanced cultural activities between the two countries. Meanwhile, Embassy continues to work to introduce Ukrainian people to Pakistan’s cultural heritage by participating in various cultural events e.g. Asia Food & Cultural Festival, International Cultural Festival of Languages and Culture, Annual IWCK bazar etc. Ukrainians have appreciated these cultural events very much. We hope to have more cultural activities in each other’s country once the agreement on cultural cooperation is signed by both sides. We have around 1500 Pakistanis living in Ukraine. 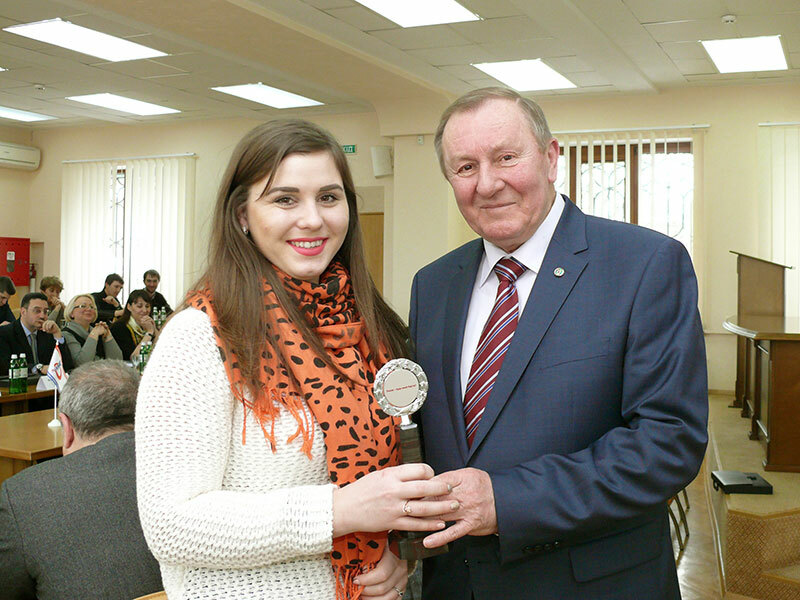 They are contributing to the wellbeing of Ukrainian society. At present we have some 70 students in Ukraine mainly in various medical, engineering and business institutions in major cities of Ukraine like Kiev, Kharkov, Lviv, Vinnytsia etc. Pakistanis do not face any major difficulty in adjusting in Ukraine and while living in Ukraine, all these Pakistanis have a desire that the country comes out of present difficult situation as soon as possible. At present there are no direct flights between Ukraine and Pakistan. However, we are negotiating an Air Services Agreement that would provide a framework for airlines of both countries to start operating direct flights. For the moment, airlines that transit through Gulf region and Istanbul provide convenient flight options to visit Pakistan. In the end, I would like to wish all the Ukrainians health and happiness. At the same time, I would like to invite the readers who belong to business and investment community of Dnipropetrovsk region to take advantage of attractive trade and investment opportunities offered by Pakistan’s economy. I would also like to invite common Ukrainians to visit my country. Pakistan has so many tourist attractions including cultural, historical, archeological and those relating to natural beauty and landscapes. Already some Ukrainian do visit Pakistan for tourism purpose but I would like to host more of them. The Embassy will extend full support in facilitating such visits. To develop and to establish new relationships, to build effective partnership, to improve and to strengthen of existing cooperation, to share experience problems of bilateral cooperation. With these purposes the Lithuanian delegation visited Dnipropetrovsk within the framework of the Europe Day celebration in Dnipropetrovsk. In the Regional State Administration office gathered representatives of government and business institutions, which were greeted by the First Deputy Head of Dnipropetrovsk Regional State Administration Mr. Oleg Kuzhman and the Ambassador Extraordinary and Plenipotentiary of Lithuania to Ukraine Mr. Marius Janukonis. Business of the region - more than a hundred representatives of companies that attended the meeting on the Dnipro CCI invitation - was represented by the First Vice President of Dnipropetrovsk Chamber of Commerce & Industry Mrs. Nina Alekhnovych. The Ambassador Extraordinary and Plenipotentiary of Lithuania to Ukraine, in his welcoming speech, noted that Lithuania traditionally is the largest trading partner of Ukraine among the Baltic countries, and Dnipropetrovsk region has the lion's share in the total Ukraine and Lithuania turnover. 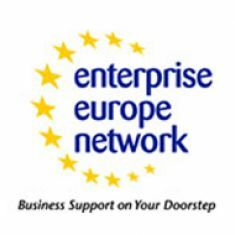 Such a meeting is aimed not only to establish new relationships between entrepreneurs, but also to provide to regional business information support concerning the nuances of the world's largest market - European. Lithuanian business delegation was represented by 12 enterprises of education, environment, software development, tourism, trade, agriculture, construction and architecture. The event program included seminars, presentations, and lectures. One of them was dedicated to the Lithuanian financial and banking sector, financing for business. Director of the Linguistics Department of the Lithuanian University of Educational Sciences presented his University to local scientists. Apart, were organized lectures of the “Ecoranga Group” lead manager, dedicated to the issues of “Waste water treatment”, “Utilization of waste, garbage, of rotting wastes”, and “Treatment facilities”. The representative and leading architect of the ”Projektavimo Sprendimai” company presented the concept of “Airport of the future: a vision of the future airport and architectural solutions for Dnipropetrovsk”. B2B contacts between Lithuanian and regional businessmen took place at the end of the meeting, during which the representatives of municipal enterprises and local companies presented projects for investment. Among them are the constructions of solar power station, creating a greenhouse and fish farms, enterprises of solid waste disposal, processing and storage of agricultural products, construction of a residential buildings etc. Also for Lithuanian investors were presented industrial parks - the areas designated for the construction of various industrial enterprises. Currently in the region there are two: in Krivyy Rih and Pavlograd. The President and First Vice-President of Dnipropetrovsk CCI Vitaliy Zhmurenko and Nina Alekhnovych visited the opening ceremony of the Honorary Consulate of Austria in Dnipropetrovsk. For today in our region has been acting the Honorary Consulates of Belgium, the Czech Republic, Germany and Lithuania, and the Austrian office is the fifth European diplomatic office in Dnipropetrovsk. In his welcoming speech to the newly elected Honorary Consul of Austria in Dnipropetrovsk, President of Dnipro CCI emphasized the importance of this event for the regional business community. Valery Kiptyk for many years is a member of the Dnipropetrovsk Chamber of Commerce & Industry Presidium, as well as he is a member of the Ukrainian Chamber of Commerce & Industry Council, his companies are the Chambers’ general partners. In this event took part leaders of regional authorities, Ms. Hermine Poppeller, Extraordinary and Plenipotentiary Ambassador of Austria to Ukraine, Consul General of the Federal Republic of Germany in Donetsk Mr. Wolfgang Moessinger. In her welcoming speech to the audience Ms. Hermine Poppeller underlined, that Dnipropetrovsk is an important city for cooperation, which is actively developing, has a strong potential for foreign investors. "I am sure that relations between Dnipropetrovsk and Austria will further deepen and strengthen. The Consulate will become a bridge for expanding cooperation between our countries and regions, the meeting place for the media, cultural and humanitarian projects. Together we will make our countries closer, " – said Ms. Poppeller. A preparatory meeting of the Committee of green services providers, which will be formally established in April of this year on the basis of the largest business association in the region – the Dnipropetrovsk Chamber of Commerce & Industry, held this month at the Chamber. 24 experts – representatives of leading regional organizations, engaged in the sphere of energy efficiency and ecology, alternative and high-energy / production management and leading engineering companies, specialized departments of Dnipropetrovsk Universities, NGOs working in the field of solving environmental problems and monitoring of the environment, development of green startups, management of environmental management and ecology of the Dnipropetrovsk regional state administration, representatives of the Program to promote green modernization of Ukrainian economy of German international cooperation office GIZ GmbH and Dnipropetrovsk CCI discussed joint efforts to promote the competitiveness of enterprises of Dnipropetrovsk region, improving the ecological situation in the region, reducing of excessive consumption of natural resources, proximity to European standards of energy efficiency, careful treatment to the environment and sustainable development. During this meeting the information concerning funding opportunities of green business projects in Dnipropetrovsk region within the Integrated Development Private Partnership (IDPP) was announced, the goal of which - implementing to the regional economy innovative technologies with a positive effect on the environment. Competition of ideas for such a project initiated by the Program to promote green modernization of Ukrainian economy of German international cooperation office GIZ GmbH. All participants emphasized the importance of creation a proper network of associates and comprehensive attraction to cooperation of enterprises of Dnipropetrovsk region, professional consulting and expert companies, certification bodies, installers of resource-efficient equipment / technology, financial institutions and civil society, science and government exactly on the platform of the regional Chamber of Commerce & Industry. Be a follower of our green services team! assistance in forming of ecological market of business consulting services of providers due the popularization of the green economy ideology, it’s advantages and opportunities promotion among users - industrial enterprises and business environment. 2. To strengthen the Dnipropetrovsk Chamber of Commerce & Industry capacity as a platform to build effective dialogue between green services players: providers, enterprise-customers-consumers, government, society, as well as to expand the range of specialized Chamber’s services. Regular seminars on legal and financial aspects of doing business for entrepreneurs - beginners from Donetsk and Lugansk regions, which received funding for restoration or development of business activities within the framework of the UNDP small grants for entrepreneurs program, were held in Dnipropetrovsk. Consultants on financial and legal issues Gennadiy Golovko and Marianna Belkina tried to cover as many as possible topics related to general legal issues for businesses and the simplified tax system in Ukraine. The opportunity to learn, appeared due to the Voucher Program, implemented within the UNDP Project "Rapid Response to the Social and Economic Issues of Internally Displaced Persons in Ukraine" with the financial support of the Government of Japan. The implementing partner in the region is Dnipropetrovsk Chamber of Commerce & Industry. During meetings entrepreneurs had the opportunity to get consultations with leading experts in specific business fields, to discuss issues that are often common to all, to share common solutions etc. Among the main problems of domestic exporters are: the absence of financial support mechanisms, the customs and logistics procedures which are complicated, absolutely non-competitive by quality and cost, ineffective policy of protecting the interests of domestic producers etc. 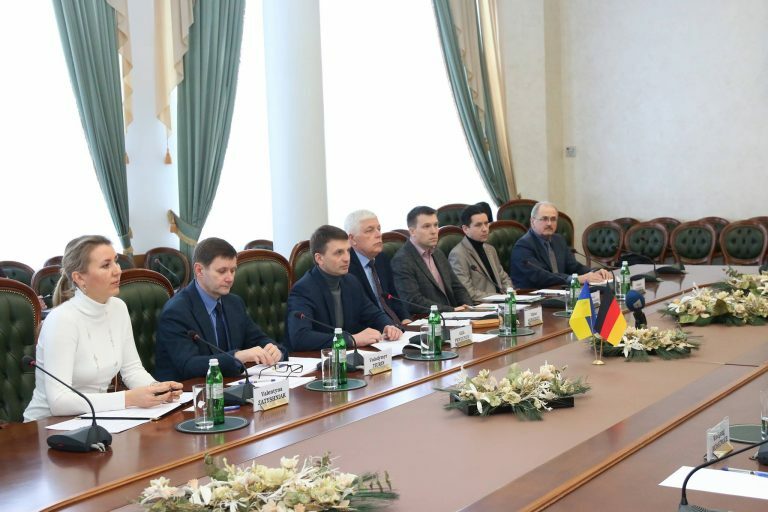 All this was discussed during a visiting session of Export Promotion Council under the Ministry of Economic Development and Trade of Ukraine, held in Dnipropetrovsk. The event gathered the President of the Ukrainian Chamber of Commerce and Industry Gennadiy Chyzhykov, Deputy Minister of Economic Development and Trade of Ukraine – Trade Representative of Ukraine Nataliia Mykolska, Deputy Minister of Agrarian Policy and Food of Ukraine on European Integration Vladyslava Rutytska, heads of relevant departments of the Ministry of Economic Development and Trade of Ukraine, businesses of Dnipropetrovsk and nearby regions. The representatives of governmental institutions in their speeches presented the state export support instruments for SMEs which eliminate foreign markets barriers and discussed with entrepreneurs issues and problems, which business has in promoting their products to the EU, US and Canadian markets. The President of the Ukrainian Chamber of Commerce and Industry Gennadiy Chyzhykov invited entrepreneurs use actively the available business support tools which UCCI and its regional offices have at their disposal. President of Dnipropetrovsk CCI Vitaliy Zhmurenko, who moderated the meeting, emphasized the importance and necessity of such discussions for uniting of government and business joint efforts to help exporters. Saxony-Anhalt is interested in qualified specialists from the Dnipropetrovsk region. 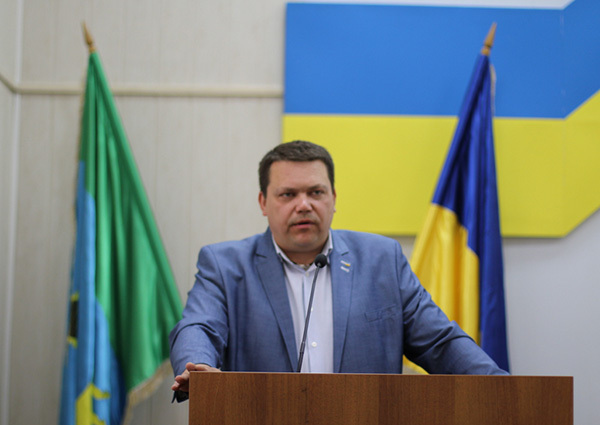 This was announced by government minister of the federal grounds Rainer Robra during a meeting at the Dnipropetrovsk Chamber of Commerce and Industry, where the opportunity to find temporary work places for Ukrainian citizens with a middle specialist education at enterprises of Eastern Germany. «The Dnipropetrovsk and Magdeburg CCI have already begun preparation for initiation of the project with work placement. A structured list of available vacancies at German enterprises has already been formed. These are mechanics, specialists for maintenance of electronіc technical equipment, operators of machinery with a numeral programming provision, medical workers, etc. The circle of interested enterprises is being decided upon, requirements for candidates and work conditions are being specified», – noted President of Dnipro CCI Vitaliy Zhmurenko. 18/11/2015 What does RECP mean? Dnipropetrovsk Chamber of Commerce & Industry organized for regional enterprises - providers of green services the unique opportunity to delegate the technical staff for training course on implementation of Resource Efficient and Cleaner Production (RECP) by the UNIDO methodology. 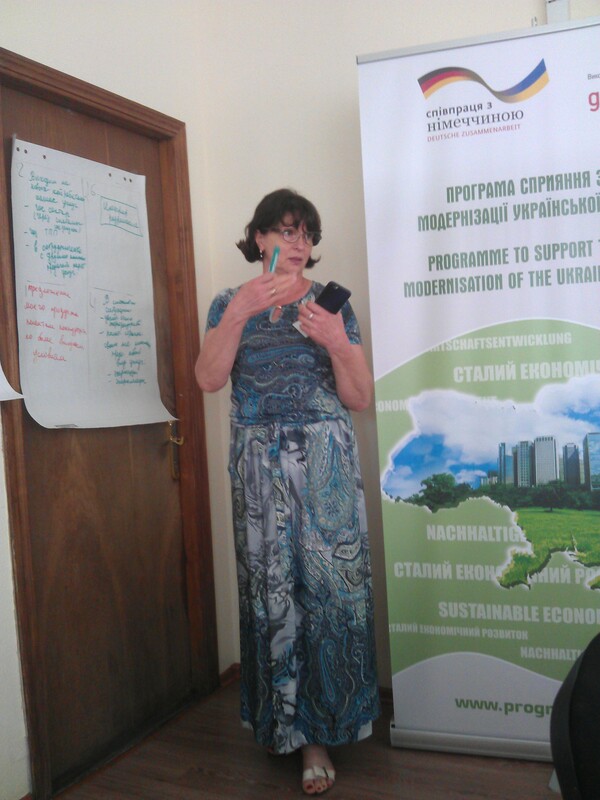 Training was conducted within the framework of promoting Green Economy Programme to support ecological modernisation of the Ukrainian economy, which implements by the Deutsche Gesellschaft für Internationale Zusammenarbeit GmbH (GIZ) on behalf of the German Federal Government. During event opening Vice President of the Dnipro CCI Sergiy Kucheryavenko declared that the trainings will not be limited only by the theory lessons, but also involve visits to regional leading companies, on the manufacturing facilities of which the practical trainings will take place. The introductory seminar course concerned the general principles of the RECP concept. Director of the Center of resource-efficient and cleaner production Igor Shylovych presented for participants the UN project for UNIDO Industrial Development. CEO and expert of the Center Taras Sakalosh and Yuri Haydayenko informed about the purpose of the introduction of clean production techniques, recommendations for the organization of work of national exporters. The main message of their performances - the idea of cleaner production is that all processes in the company can be improved so that not only to reduce waste and environmental pollution, but also to maintain or obtain additional economic benefit. President of Dnipropetrovsk CCI Vitaliy Zhmurenko and members of the regional business community joined the public discussion within the project "National dialogue: discussion about the tax reform concept " with the participation of Deputy Minister of Finance of Ukraine Olena Makeyeva. For the general discussion was carried off the project developed by exactly the Ministry of Finance. Olena Makeyeva informed that the planned transformation in any case will not be at the expenses of the poor people and pensioners. It is mandatory to create equal conditions for businesses and simplify tax administration. That is why the basis of the principle of the proposed reform laid down “flat” tax rate - VAT, corporate and individual income tax and Single Social Contribution rate will be 20% each. Most of the comments were concerned the business problems that was accumulating in this area over the years - an opaque administration, the tax burden etc. There was also hard critic. Representatives of small and medium enterprises emphasized the necessity of creating of a particular taxation model for SMEs because, in their view, the new reform ignores their needs and mainly focused on the interests of big business. The draft of Tax Code of Ukraine is still being supplemented; many points are to be changed. It is possible that it will be announced together with the draft of the State Budget in January 2016. - Involves a public discussion with representatives of the expert community, business and society in Lviv, Kharkiv, Dnipropetrovsk and Kyiv. Dialogue with the Polish colleagues. First Vice President Nina Alekhnovych and Vice President, Head of Foreign Economic Relations Department of Dnipropetrovs’k Chamber of Commerce & Industry Sergiy Kucheryavenko discussed important practical issues of interregional partnerships with Vice President of Polish-Ukrainian Chamber of Commerce Andrzej Drozd, director of non-investment projects of Lublin city government Krzysztof Latka and Radom County mayor Robert Zakrewski. During a meeting Andrzej Drozd presented the Polish-Ukrainian Chamber of Commerce activities, which now unites about 450 members and has head offices in Warsaw and Kiev, units in Katowice, Lublin, Lviv, Ivano-Frankivsk. He also shared with the Chamber’s plans regarding intentions to arrange a series of educational business activities which will assist to business development in Ukraine. Krzysztof Latka presented Lublin free economic zone, offices servicing activities of investors and incubators (about 20 in the city), cooperation within the "Eastern Partnership", the work of the International Exhibition Centre. He emphasized the priority of the project "Lublin - the gate to Poland", which is promising for the Ukrainian enterprises on its way to the Polish and the EU market. Robert Zakrewski told about the economic potential of the city which he represents, more detailed about the most developed areas: the manufacture of furniture, metal structures, design of private aircraft, and machinery for agriculture. In conclusion the parties agreed to send each other additional suggestions and propositions for dialogue continuation. Dnipropetrovsk Chamber of Commerce & Industry launched series of specialized practical ecological seminars, the main aim of which - to increase professional level of ecology experts, to introduce them with legislation and licensing system changes, with management methods in the enterprise, establishing the procedure of internal operation of relevant specialists. During first seminar qualified speakers - representatives of state agencies, of project organizations on the Environment and Nature, scientists and environmentalists practices, discussed the current implementation of electronic system of licensing procedures in the field of waste management. 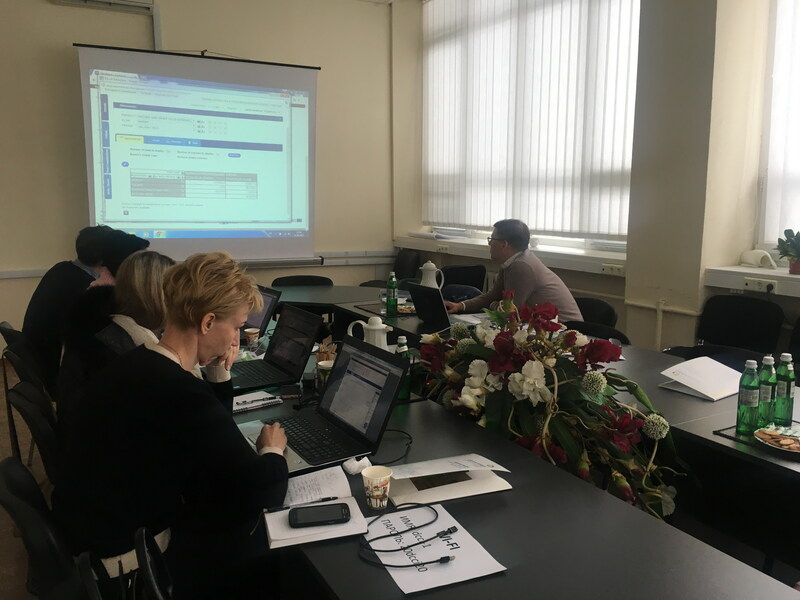 Participants had the opportunity to test new web resources, review the rules, required documents, to get the information and submit an electronic declaration waste on-line on site of the Ministry of Ecology and Natural Resources of Ukraine (http://menr.in.ua). At the beginning of September, Dnipropetrovs’k Chamber of Commerce and Industry supported by the government of the United Kingdom launched the project that involves carrying out series of free informational and practical workshops covering a vast range of trade and economic issues on the way towards the EU. The first two of five workshops conducted in the reporting period by the expert-analyst, director of International Institute of Business Galina Perepelitsa and director of the Department of Issues of Standardization, Technical Adjustment, Certification and Balanced natural resource management of the Ukrainian CCI Ol’ga Marushevs’ka – “Practical aspects of partnership with the EU”. The next workshop devoted to the peculiarities of the tax system of the EU was divided into three parts: tax policy of the European Union, its directives in this sphere, regulation of transfer pricing etc. ; basic principles and stages of development of VAT system in the EU, operations, which are subjected to taxation, and rules of application of Taxpayer Identification Number, system of excise duty payment on different sorts of production (alcohol, tobacco, electric power), juridical frames of implementation of electrical trade in the EU etc. As an example, the audience has been familiarized with tax system of Estonia. It was assisted by the lecturers – Lina Novikova, Marianna Bielkina, Olena Boboshko – the experts-practician from the juridical company FTL Assistance, which, in fact, engaged in tax planning for Ukrainian companies interested in cooperation with European countries. The continuation of the subject was during another workshop “European jurisdictions as the mechanism of business optimization”. The lecturers - director of FTL Assistance Lina Novikova and chief consultant of BTP Group Olena Kuznetchikova shared their experience how to run your own business using registered in the EU companies; they made comparative analysis of the most popular and effective European jurisdictions; explicated the principles of business-models organization, opening and using accounts in European banks, getting the European habitation certificate. Ghanna Venda, the founder of the Polish company ModernWay reported during online conference about the requirements to the companies and their activity, taxation in Poland. The fifth workshop on “Protection of intellectual property rights of Ukrainian enterprises while entering the EU market” took place with Ukrainian and foreign experts-patricians. The workshop considered expected changes to the Ukrainian legislation due to the Ukraine–European Union Association Agreement signing; basic regulations of the European Union in the sphere of intellectual property, the Polish experience in this segment, practical tips to Ukrainian businessmen, the European Patent, technology protection in the EU; intellectual property objects audit end export etc. Director of the company “IPStyle” Mariya Ortyns’ka, who is also the patent attorney of Ukraine reported as a lecturer about the peculiarities of the registration of trademarks, patenting of inventions, utility models and industrial samples in the EU. She paid attention of regional entrepreneurs to that Paragraph 9 of the Ukraine–European Union Association Agreement was completely devoted to intellectual property. According to the part 3 of the Article 202 of this document, Ukraine is obligated to protect the geographical indications. About three thousand European item names soon will be prohibited to use in names of Ukrainian products. These changes, first of all, will influence alcohol production manufacturers. Ten years transition period is set for them, during which such titles as Champaign, Cognac, Madeira, Porto, Sherry, Calvados, Grappa, Portuguese anise, Armagnac, Marsala, Malaga, Tokaji, Czech beer should be deleted from Ukrainian products names. Milk and cheese producers prevent using such titles as Parmesan, Roquefort, Feta during a period of seven years. Actually, Ukrainian geographical indications are provided with high level of legal security. Our manufacturers have a right to highlight the originality and territorial specialty of their goods. Positive changes, contained in the Agreement, include the increase of trademark non-use period for previous cessation of certificate from 3 to 5 years. 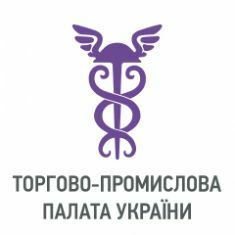 And the fact that Ukraine committed to open access to the electronic database of submissions for trademarks registration, gives the opportunity to follow applications submitted in violation of the rights, in time complaint against violators at the stage of registration makes assessment process of registration trademark usefulness cheaper. Today, such information can be obtained only in a branch of the National Enterprise “Institute of industrial property” (Ukrpatent), it costs more than 720 UAH. Practical examples were considered too. Partners IPStyle Poland - Patent AOMP Polska Z.o.o shared their experience in the field of intellectual property. Deputy Ambassador of the United Kingdom Martin Day, drawing up the transitional results of studying, determined its main goal not only as explanation of practical aspects of collaboration with the EU, but also as a possibility to demonstrate to Ukrainian companies that it is possible to be successful on this market and free trade can be mutually beneficial. The motto of a new project – “Stronger together!”. 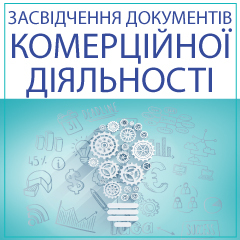 Methodical references with step-by-step algorithm of actions, based on results of each workshop for entrepreneurs’ assistance are available at web-sites of Dnipropetrovs’k Chamber of Commerce and Industry and some other regional Chambers. - increasing of tempo of involvement of direct investments in economy. It has been earned almost $180 million from the beginning of the year, and the total volume amounts to $8 billion. Thus the region keeps by rights the status of investment gateway of the country. - active implementation of important regional projects mutually with United States Agency for International Development “USAID”, European Union, UN, the World Bank (Ukrainian Social Investment Fund), government of Canada . - improvement of financial activities of the national enterprises. Dnipropetrovs’k Chamber of Commerce and Industry, where more than a half about 900 of its members are enterprises of real production sector, is proud with these labor achievements and sets new goals for itself in the sphere of supporting the business. Dnipropetrovs’k hosted the large conference on issues of prospects for business in Ukraine in framework of signed an agreement with the EU. To help businesses as soon as possible enter to the open door, to adapt and work effectively Dnipropetrovs’k Regional State Administration, Regional Council, Regional Chamber of Commerce and Ukrainian CCI gathered more than 600 representatives of large companies, small and medium enterprises to large-scale conference "Prospects for business in Ukraine in framework of signed an agreement with the EU " with leading national experts. The event was organized for the implementation of the recently signed quadripartite Memorandum of Understanding between business associations (Ukrainian Chamber of Commerce & Industry and Dnipropetrovs’k CCI) and regional authorities (Regional State Administration and Regional Council). 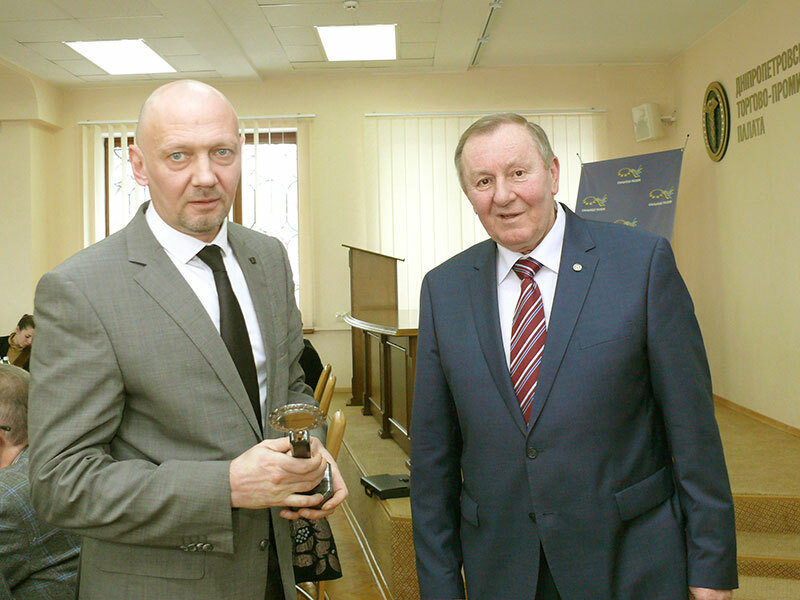 Conference was moderated by the president of the Dnipropetrovs’k Chamber of Commerce & Industry Vitaliy Zhmurenko. He said that Dnipropetrovs’k region has the potential for the revitalization of businesses, creating new jobs, attracting investment, the return of lost economic position and rapid build-up of the economy, leading to increased social benefits. These processes go faster if more people will turn to them. The participants were also welcomed by the Chairman of Dnipropetrovs’k Regional Council Eugene Udod, President of the Ukrainian Chamber of Commerce and Industry Gennadiy Chyzhykov, Deputy Governor Stanislav Molokov and the mayor of Dnipropetrovs’k Ivan Kulichenko. - Practical assistance to exporters from the Ukrainian Chamber of Commerce and Industry in framework of an agreement with the EU. After the conference, participants had the possibilities to read the information resources on these topics, get answers to all questions in the consultation centers organized in the registration area.